It’s not “How are you feeling?” or “What was the most common disease that you treated?” or “Based on what you experienced, what is the projected future for the health care system in the country?” No, people want to know what I had for dinner. It may be because I’m a food blogger, but even before I started blogging, this is what people wanted to know when I returned from the field. So much for being concerned about the important stuff. 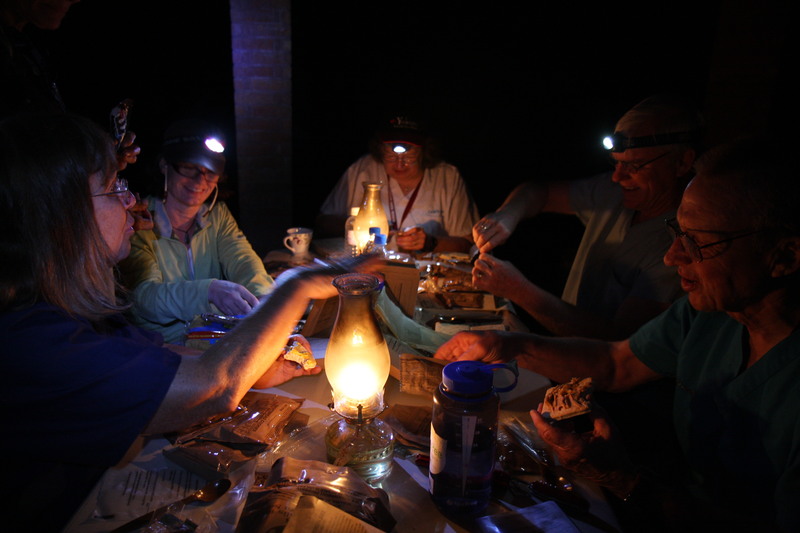 Friends were more eager to learn about the exotic and unusual morsels that I was consuming in the field. 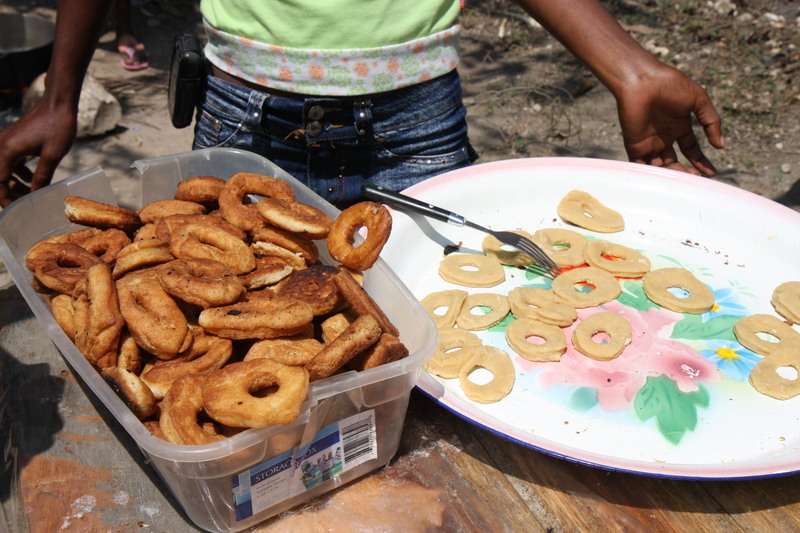 Perhaps the most interesting feedback that I could give from my Haiti trip was the pre-packaged and processed foods. Obviously, in a post-disaster setting, it’s slim pickings and canned or dry goods become more valuable than gold. At times we feasted on canned sardines preserved in olive oil, or creamy Nutella spread on stale crackers that bent in half like wet cardboard. People were known to hoard valuable jars of peanut butter in their tents. 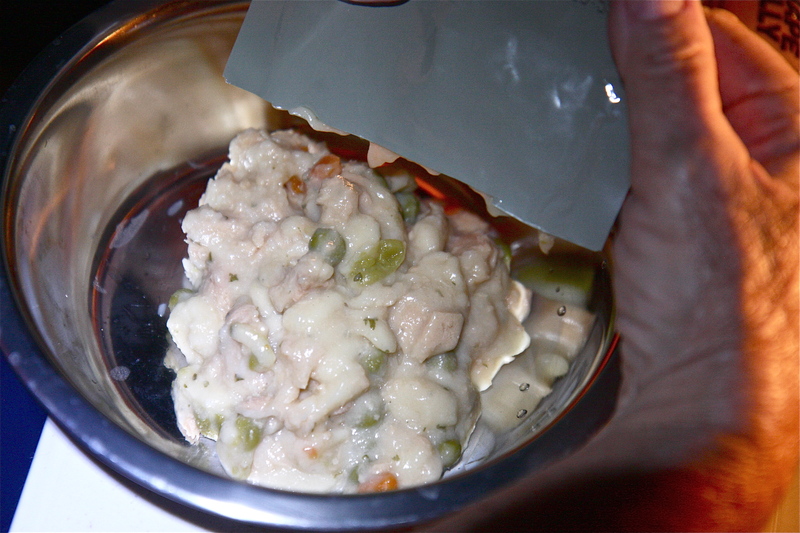 And how can I forget the tin of duck meat terrine with vegetables that magically appeared out of nowhere? I’m not sure where it came from, perhaps it spilled out of the cargo from one of the French organizations that we shared the campsite with, but this unusual offering got my deprived taste buds excited. As the contents of the tin bubbled with the heat of the canned gel fuel underneath, the savory aromas made me drool uncontrollably. 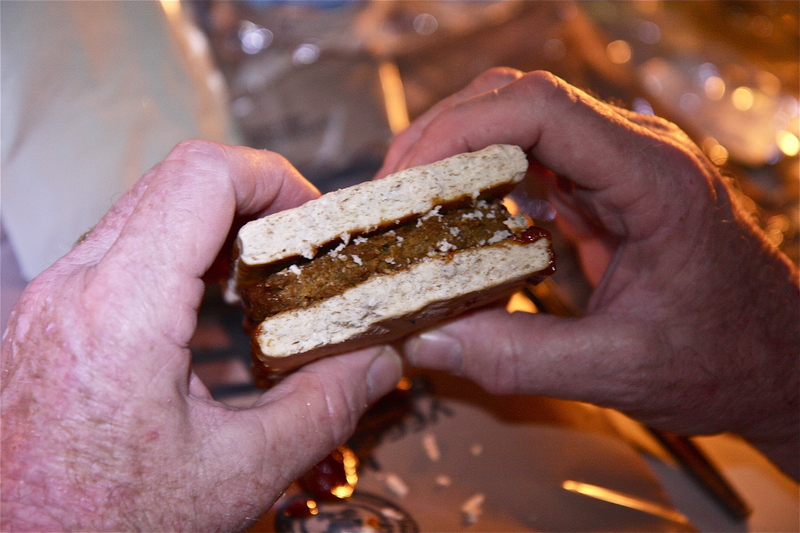 After all, the highlight of each day was to eat granola bars and fig newtons that I brought with me from the US. Sadly, it did not deliver, and it tasted like something that even my dog would spit up. 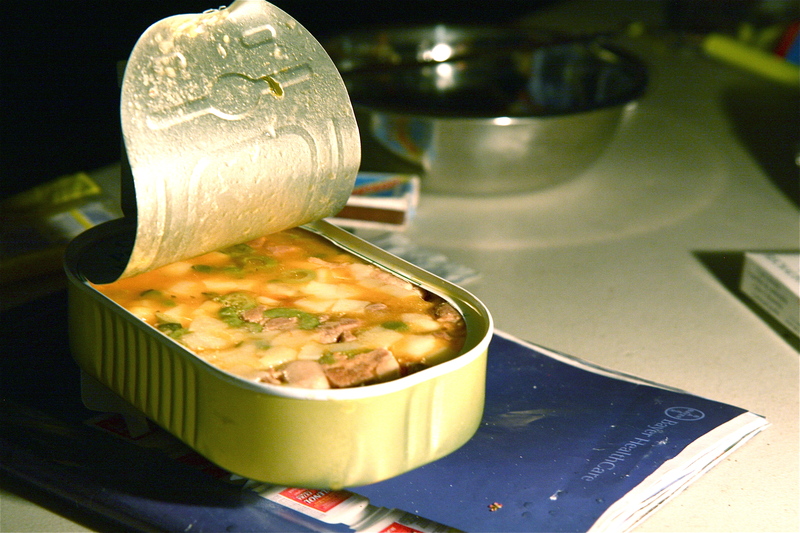 Alas, canned food is….canned food. 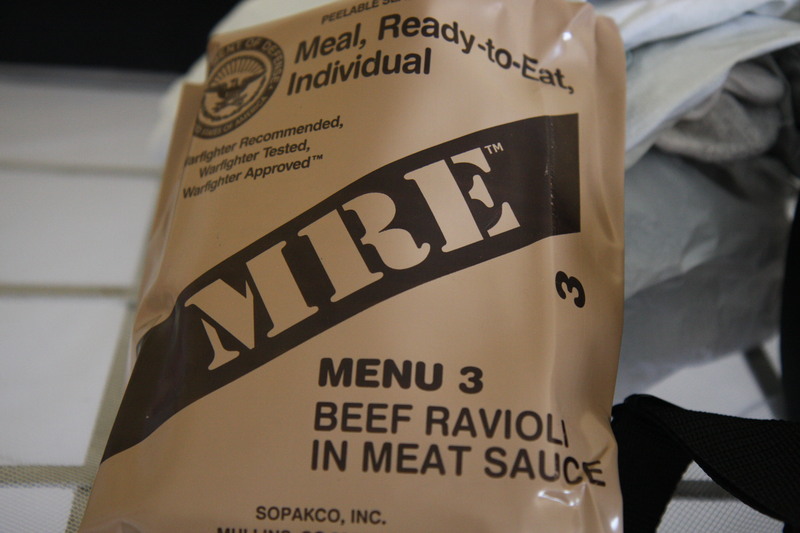 The most intricate and conceptually interesting packaged foods that we consumed were the MRE’s, short for ‘Meal, Ready-to-Eat’, which are the completely self-contained meals that provide nutrition for soldiers in the U.S. military. MRE’s were first introduced for military use in 1981, and have gone through many incarnations through trial and error in famous combats like Operation Desert Storm. 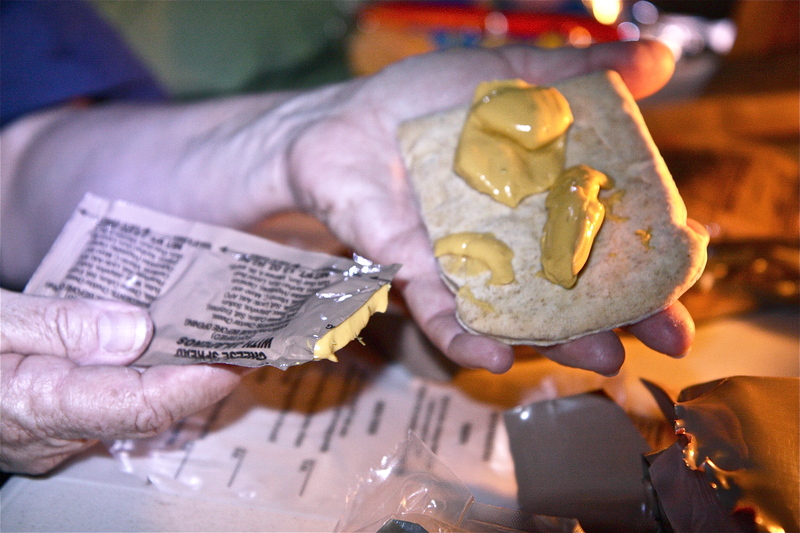 Typical contents in MRE’s, which are individual rations intended to provide soldiers with high calorie energy to sustain them during warfare, include an entrée, side dish, crackers, peanut butter or cheese spread, dessert, instant coffee or tea, matches, gum, toilet paper, plastic utensils and a heating device to heat the entrée. Some of the packets even had miniature tabasco bottles, valuable commodities that were traded in the campground black market. Each large brown package clearly marked with a menu number and the name of the entrée contains individually sealed plastic packages of the various components, so you can save your pack of smoked almonds, chocolates, wafers or tea for a later time. 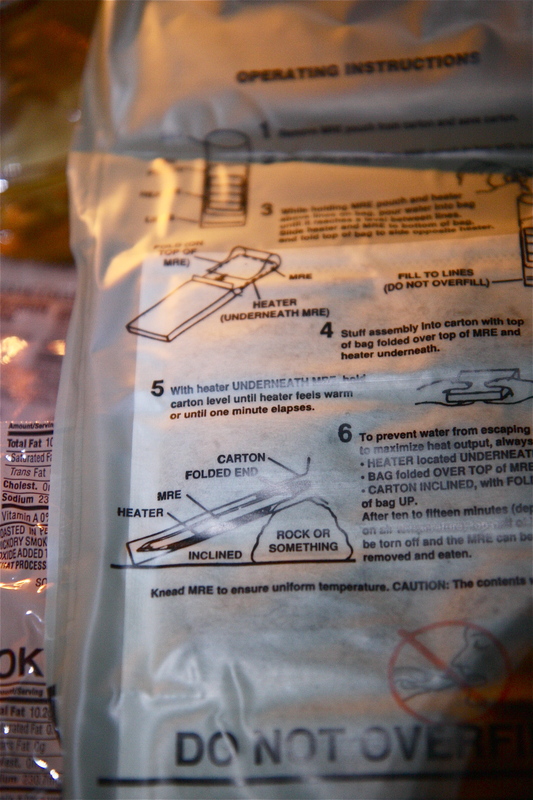 Opening an MRE bag was like unwrapping Christmas presents. There were so many gifts of creature comfort delights tightly packed into each bag. 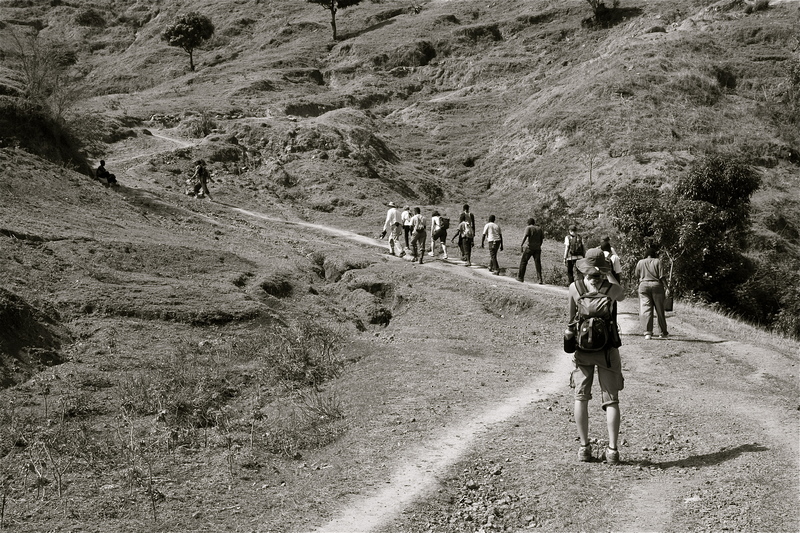 It was always a joyous and exciting moment in the midst of an intense field experience. The concept of bread and thick cheese spread sounded enticing, but it wasn’t as aesthetically pleasing or tasty as it seemed. 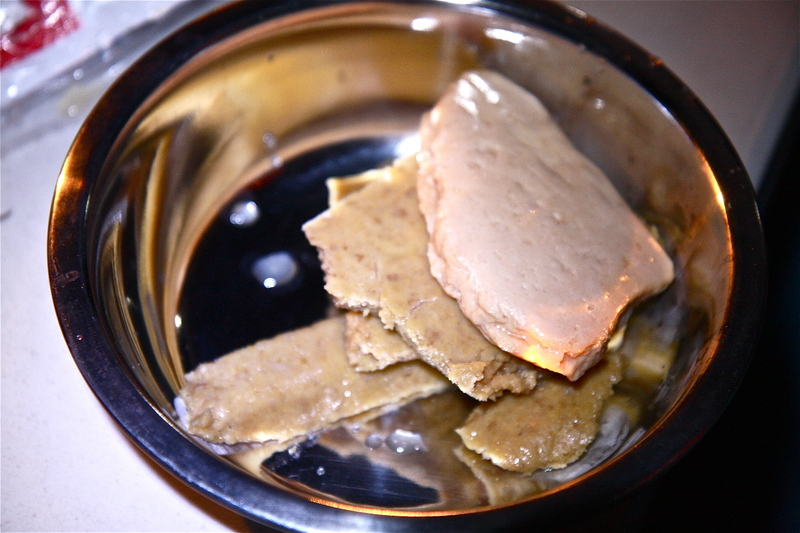 The texture of the bread was that of the ends of a loaf of bread, microwaved twice and left out to dry, then reconstituted with water- you get the picture. I suppose it’s impossible to get a soft buttery brioche bun in a military ration. 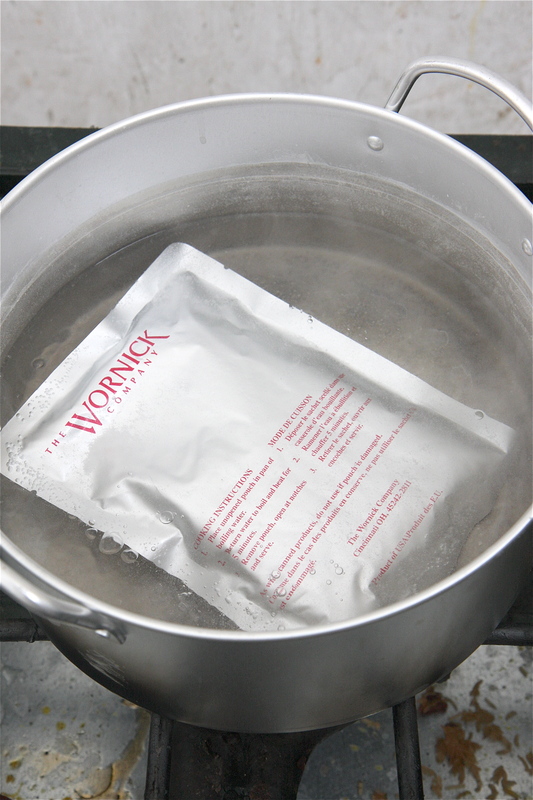 Flameless Ration Heaters (FRH) were included in each bag, providing a safe and quick method to heat the entrées without the need for fire or gas. All you had to do was insert the entrée bag inside of the FRH bag, pour a bit of water inside, and within seconds the whole device started heating up to a scalding temperature. Within 12 minutes, the entrée was piping hot and ready to eat as if it just came off the stove. It was genius and clever- who would have thought that chemical reactions could satisfy our hunger in desperate situations? 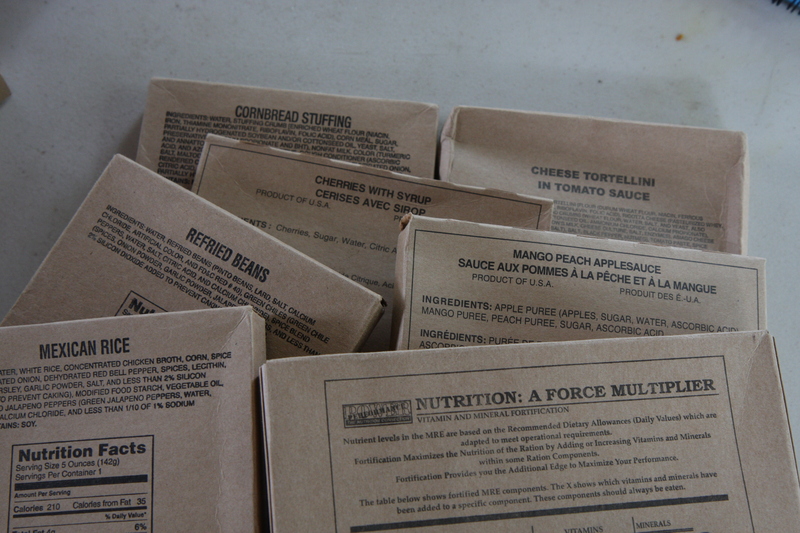 There are 24 MRE menu items in the US military version, with 4 vegetarian options. Each ﻿entrée comes with a number, and you can tell when somebody’s had a little too much experience eating MRE’s in the field when they refer to their dinner choice not by the menu but by the number. Menu 1 is Chili with Beans. Menu 2 is Chicken Fajita. 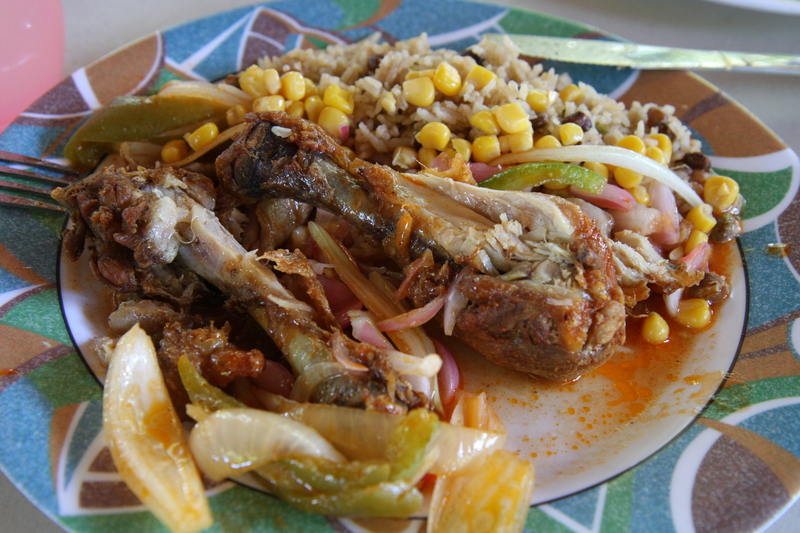 Menu 14 is Ratatouille, and so on until Menu 24 which is Buffalo Chicken with Santa Fe rice and beans. Menu 12, the Vegetarian burger, came out of the FRH with a heavy thud, making me wonder if it was made with some type of clay, which still technically qualifies as vegetarian. 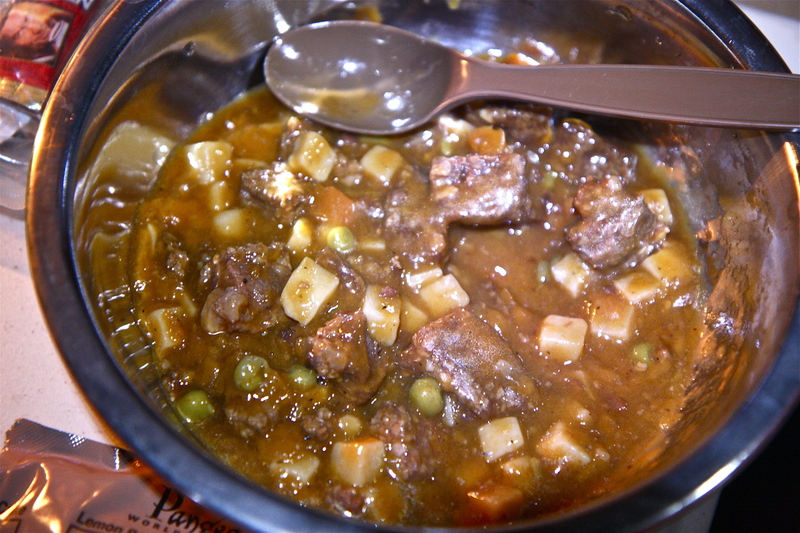 Menu 9, Beef Stew, looked like a familiar canned mixture that can be found in supermarket aisles. Don’t even get me started with the Pork sausage with gravy, Menu 17. Menu 22, Chicken with Dumplings, came with high recommendations from some folks in the Canadian army who helped us with logistics around the campsite. They claimed that the U.S. MRE’s were the best in the world, tasting better than even their own country’s and the European versions. 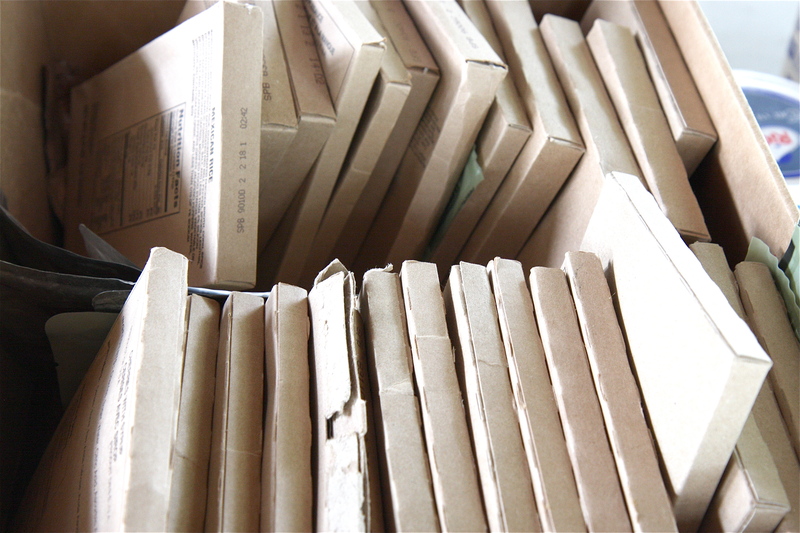 MRE’s are military rations, and other countries in the world have their own version. I was disappointed to find out that the Aussies don’t offer kangaroo or wallaby. Instead, their choices include standards like chicken tetrazzini and lamb casserole. Italians, as expected, offer a pasta dominant list with raviolis and tortellinis. The Germans have liverwurst, beerwurst and lots of sausages to keep their civilians happy. It’s too bad that they haven’t found a way to engineer powdered packets of beer to accompany the wursts. 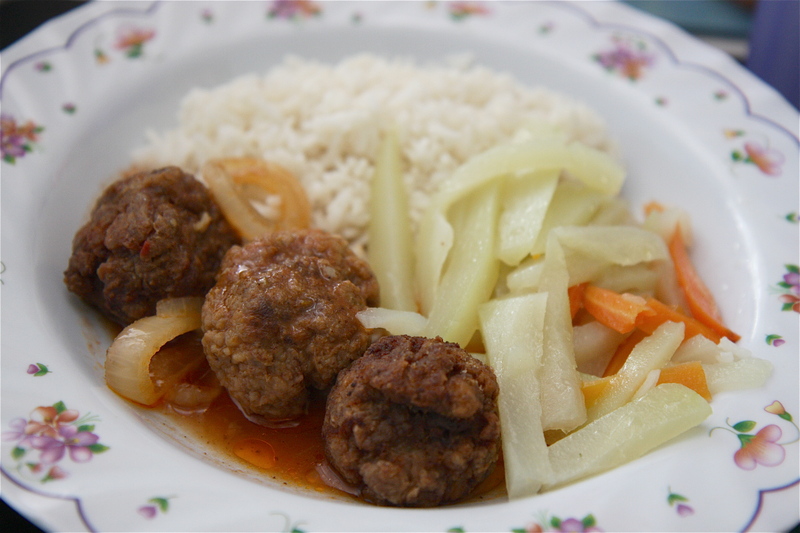 The Canadians have a pretty diverse and international menu, offering choices from pork with wine and herb sauce, to Hungarian goulash and beef chop suey. Leave it to the French to claim culinary supremacy even in military pre-packaged rations- sautée of rabbit, ‘Parisian chicken’, and Squid Armoricaine? Ooh la la! We also had individual meal packs (IMP), a different type of military ration where each food item comes in their own box without all of the other extra items. We often used these, like omelette with salsa, refried beans, peaches in applesauce, and cheese tortellini, for breakfast and lunch. These silver retort pouches, made with foil, simply need to be boiled in a pot of water for 10-15 minutes for easy preparation. 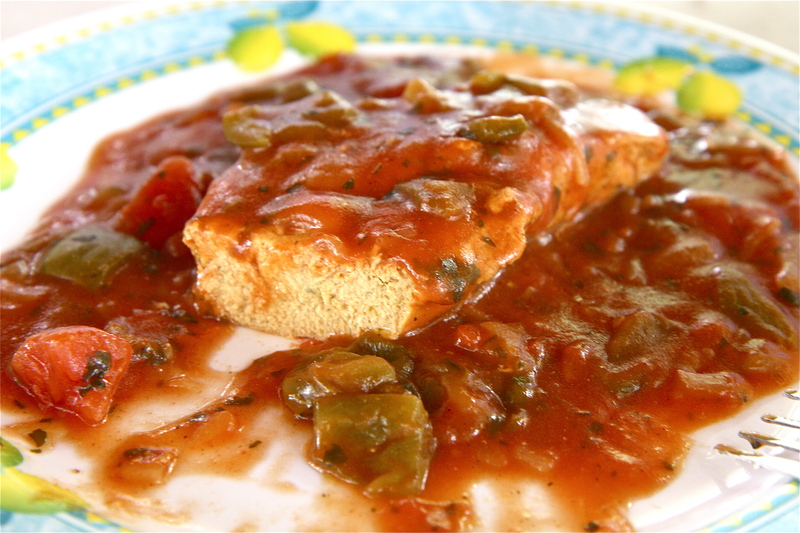 One morning I decided to try to Omelette with Salsa, thinking, ‘How bad can it be?’ I had delirious visions of a fluffy and buttery omelette, but when I dumped it out of the retort pouch onto the plate, it felt like a 5 pound dumbbell. When I hacked through it with a large fork, I saw a grainy cross section of a yellow fiberglass brick. Perhaps we can use this as building material for new homes in Haiti? MRE’s are supposed to have a shelf life of at least 10 years, but I’ve heard that they pretty much last a lifetime. It’s scary to know that even after 75 years, you can still heat up and enjoy Menu 21, Lemon Pepper Tuna, or Menu 16, Pork Rib. Obviously these plastic bags are non-biodegradable, if they have to withstand rough handling in a military war zone, and are made to last through generations. I saw many empty MRE bags cluttering the already polluted streets of Haiti, and a few even in the beautiful green mountains of Les Cayes, not to mention the tens of thousands of water bottles consumed by aid workers that have no way of being recycled on this island. I felt sad that foreign aid was coming into this poor and devastated country in this time of crisis with good intentions, and instead creating a ton of unnecessary waste. 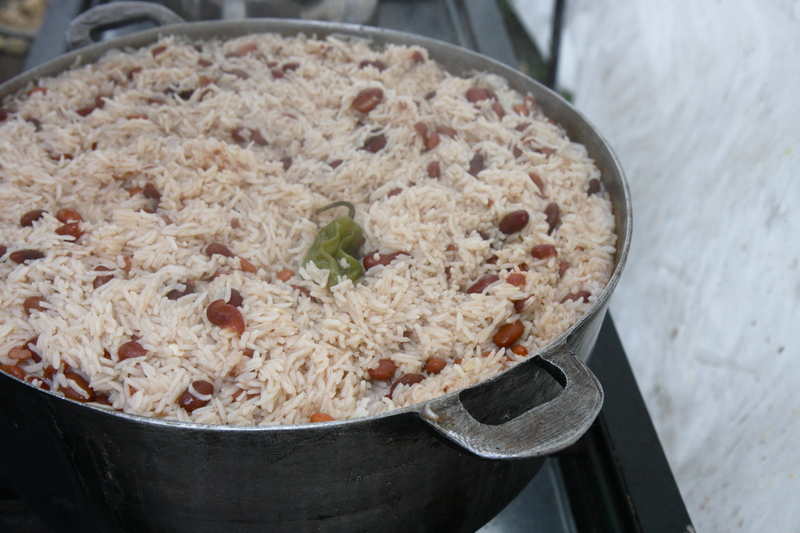 This is why our team only ate MRE’s in extreme emergencies, and otherwise ate the food that was prepared daily by our Haitian cooks in the campsite kitchen. The kitchen was really just an area boxed off by a white tent. Picnic tables doubled as both pantry and prep area, although most of the prep was done on the ground. Gas canisters heated 3 stoves that were always bubbling with the day’s dinner offerings. 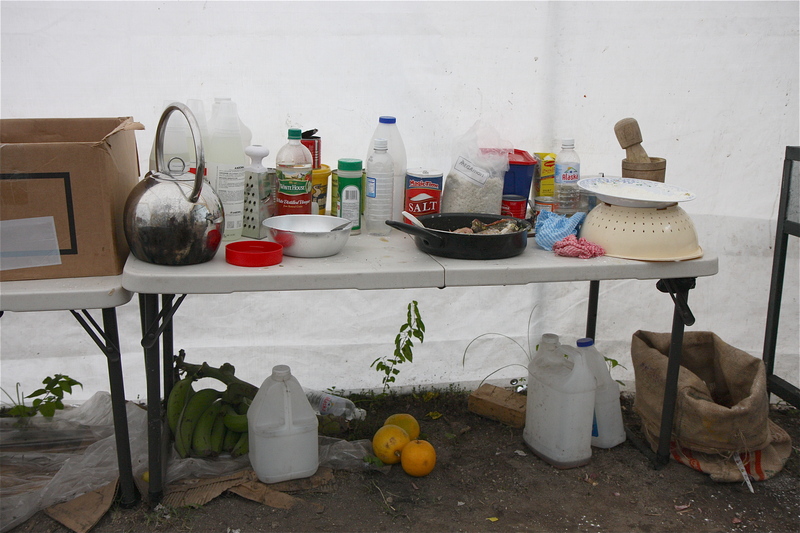 Compared to what most Haitians had in the IDP camps, which was practically nothing, this was a luxurious and sophisticated set up for fine dining. 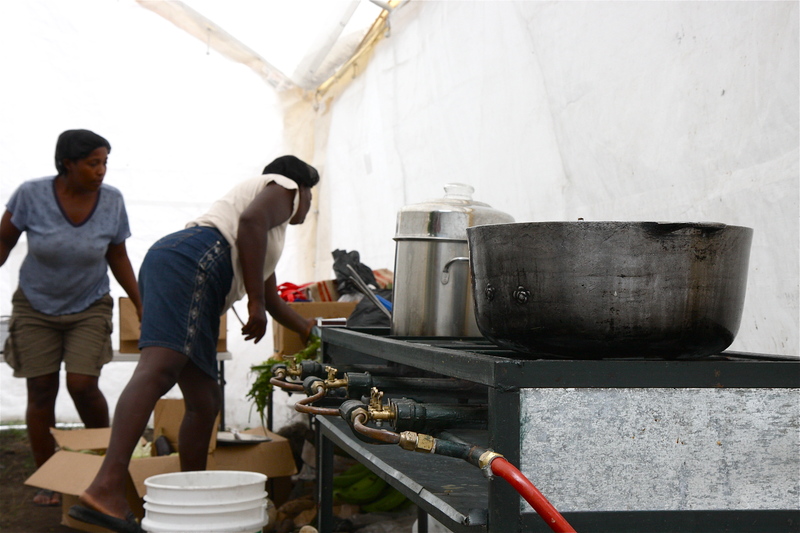 In humanitarian projects, it’s standard to hire local people to do laundry, cleaning and cooking for the team. It’s a mutually beneficial relationship, as this significantly frees up time for the aid workers to do their work, and generates much needed employment and income for the local people. 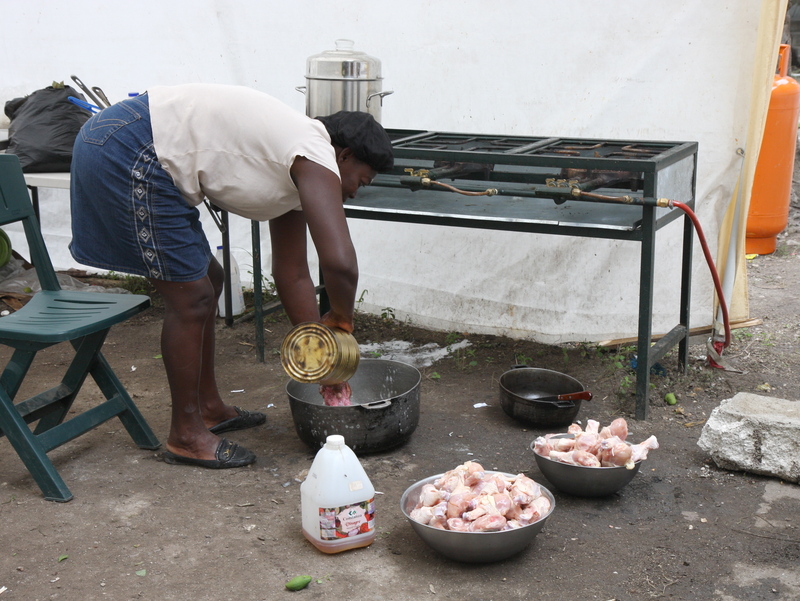 It’s not an easy job to cook 3 meals a day every day for a camp full of hungry foreigners, which at times numbered up to 45 people, but our Haitian nannies did a fantastic job. 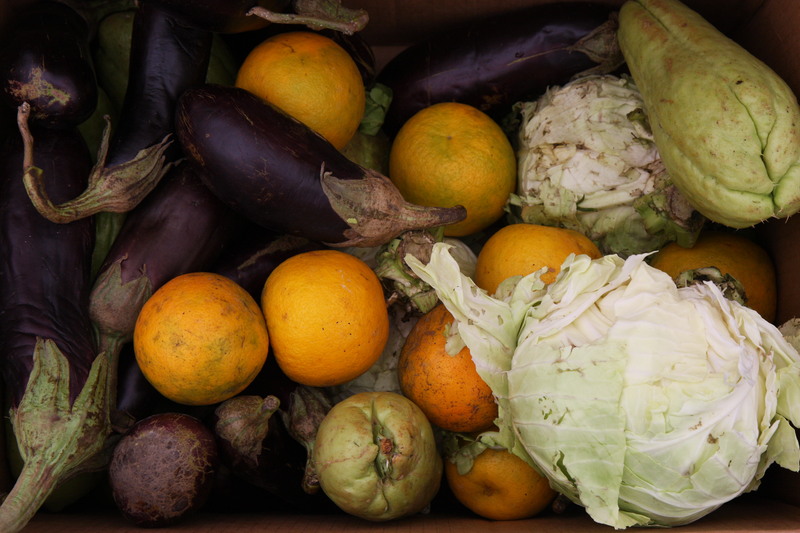 They even followed strict hygiene and food sanitation practices by washing vegetables and utensils in chlorinated water, keeping everybody healthy and diarrhea-free. In the field, Clorox bleach and alcohol hand sanitizers become your best friends. 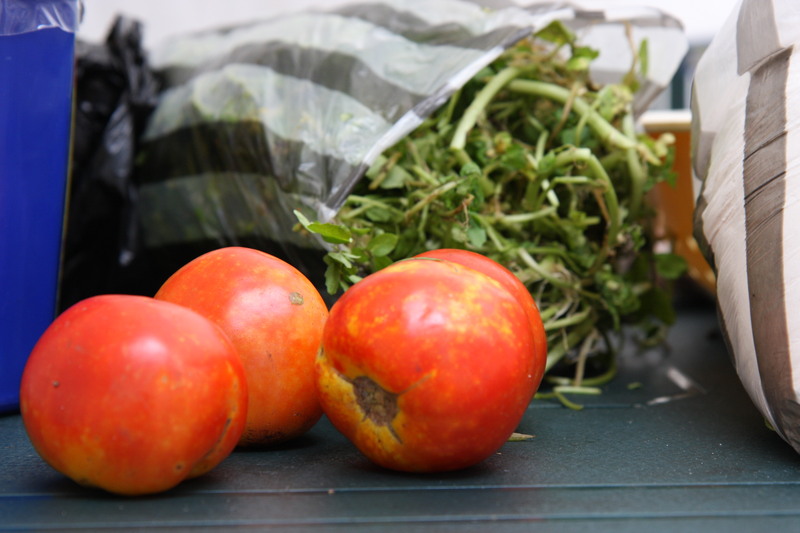 Even so, it’s very easy to fall ill with food-borne illnesses, as demonstrated by our preceding medical team which at one time had to simultaneously nurse 5 incapacitated team members with IV fluids and medications. 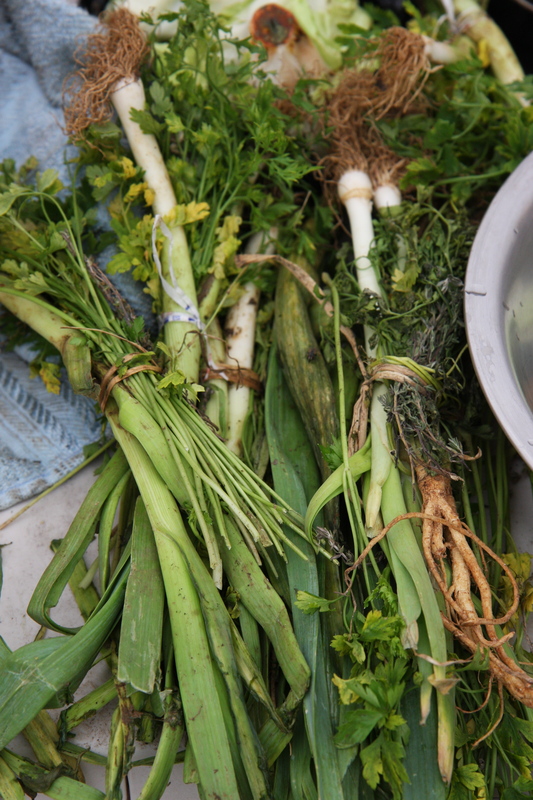 I was surprised to see fresh vegetables in the local markets that were being used in our food. 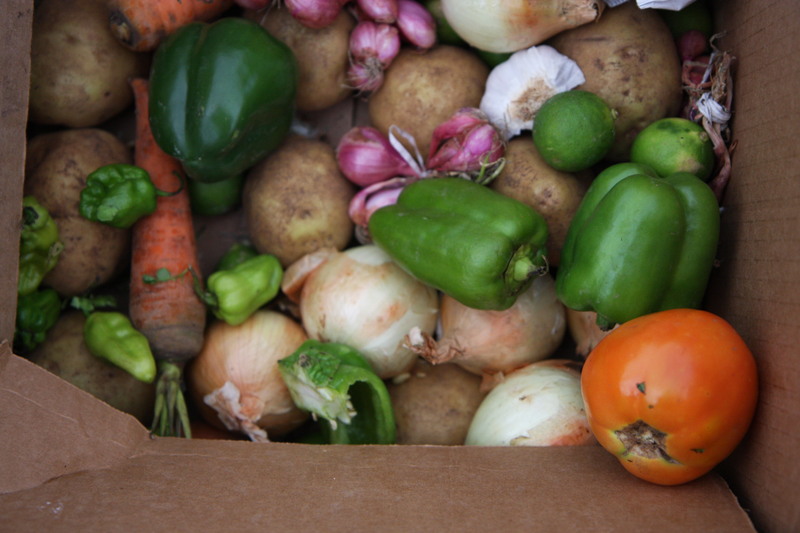 Tomatoes and onions were a staple in every meal, creating the base for all sauces that garnished our proteins. Carrots and green peppers added color and texture while large purple eggplants added much needed variety to some of our dishes. 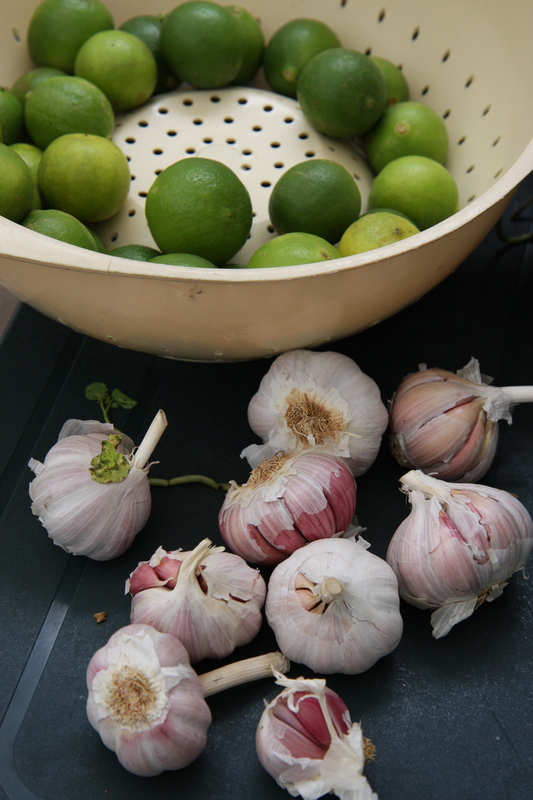 We even had lime, garlic, green onions and parsley to season the food. 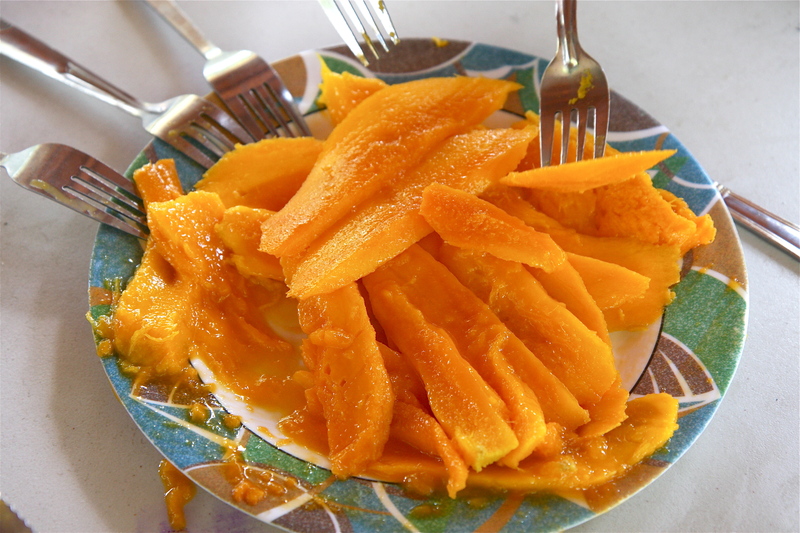 The best and freshest produce were the mangoes, which multiplied and grew like bacteria on the trees which surrounded our campsite. 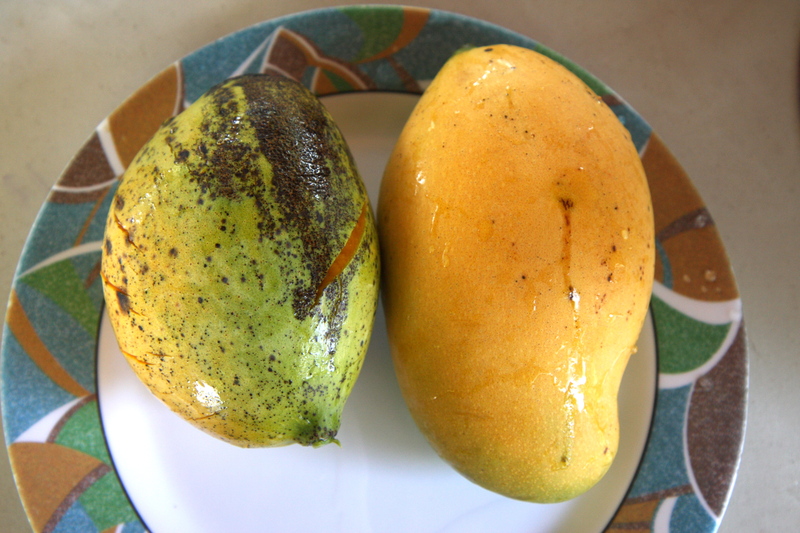 Our tents were under a mango orchard, a blessing on those long hot days after seeing up to 300 patients, but an absolute terror during the evenings when falling fruits pounded down on our tents like bombs. It wasn’t unusual to have red meats like beef and goat for dinner. 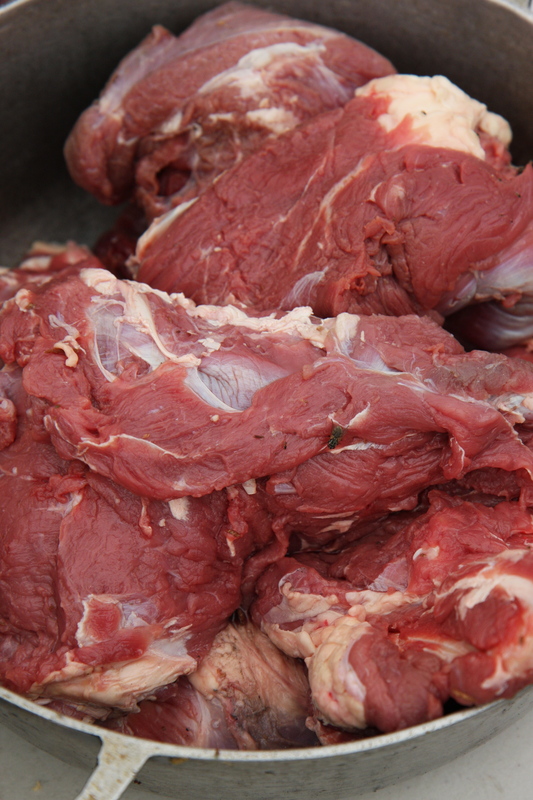 Beef cuts were usually lean and tough, as the few cows that I saw grazing in the pastures were just as bony and malnourished as some of the children. 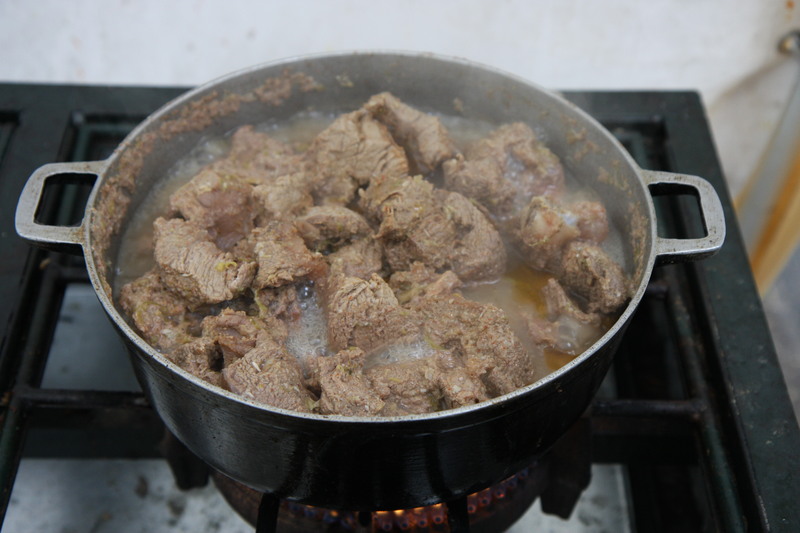 To counteract the toughness, these meats were usually boiled first, then deep fried or stewed. 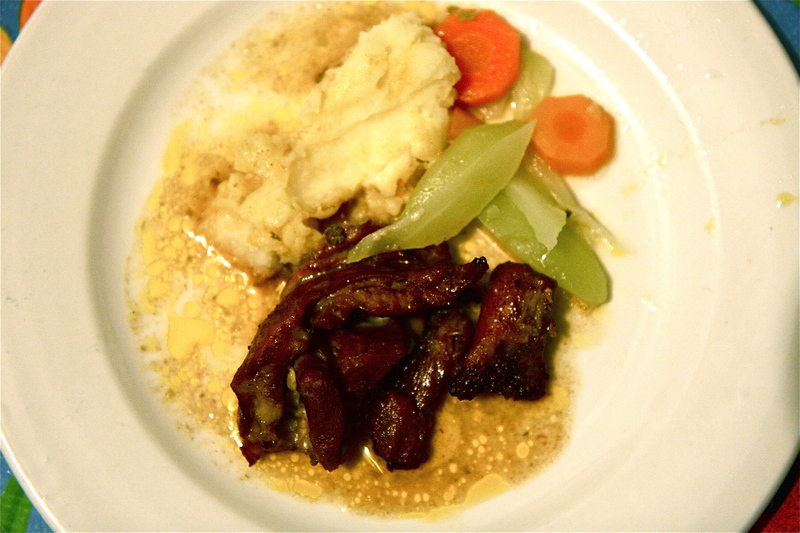 One of the tastiest meals that I enjoyed in Haiti was the braised goat with militone and carrots. Militone is a type of green squash that is native to Haiti, and it tastes like a cross between braised cabbage and boiled broccoli stem. Another item that made my day was roasted beet salad, cubed into bite size pieces and mixed with a white cream sauce of some sort to render it bright fluorescent pink. There was only 1 day during the whole month that we had a welcome break from animal meat with freshly caught ocean fish, marinated with citrus and herbs and deep fried in oil. As you can imagine, this was a wildly popular item and the fish went fast. 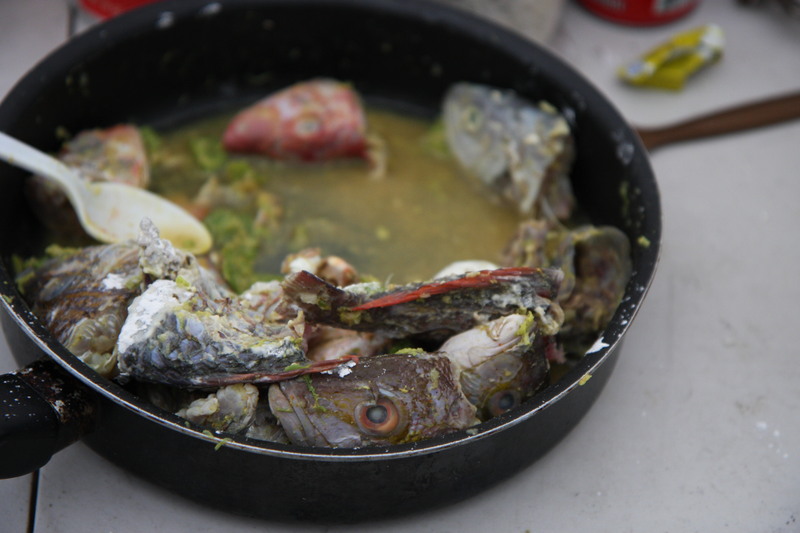 By the time I got to the dinner table there was only 1 fish head left. 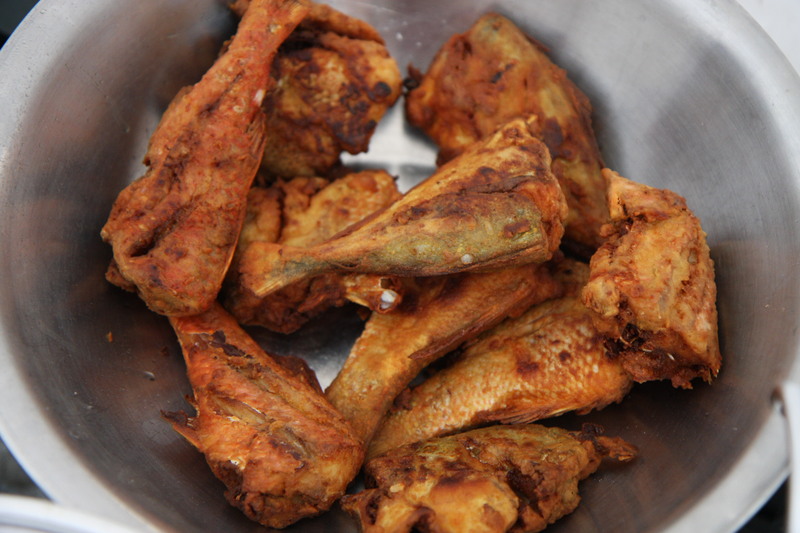 Most of the time we had chicken drumsticks, predominantly deep fried and at times stewed in a canned tomato sauce mixture. 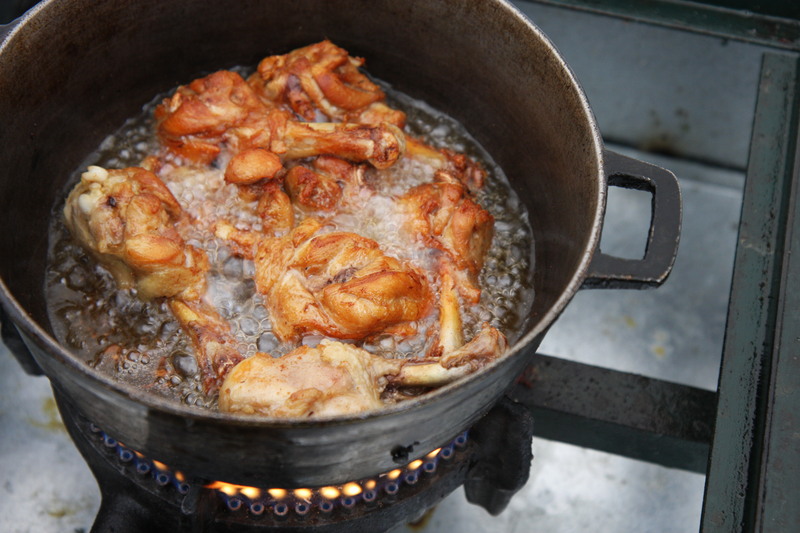 I have never had so many chicken legs before in a month- not that I’m complaining, since it’s a miracle to even be able to get this type of food in a humanitarian mission setting, but I was always left wondering where the breasts, thighs and wings went. With sauteed vegetables, rice and sprinkles of canned yellow corn, these meals were at times the only thing that kept me sane on those grueling and exhausting days. 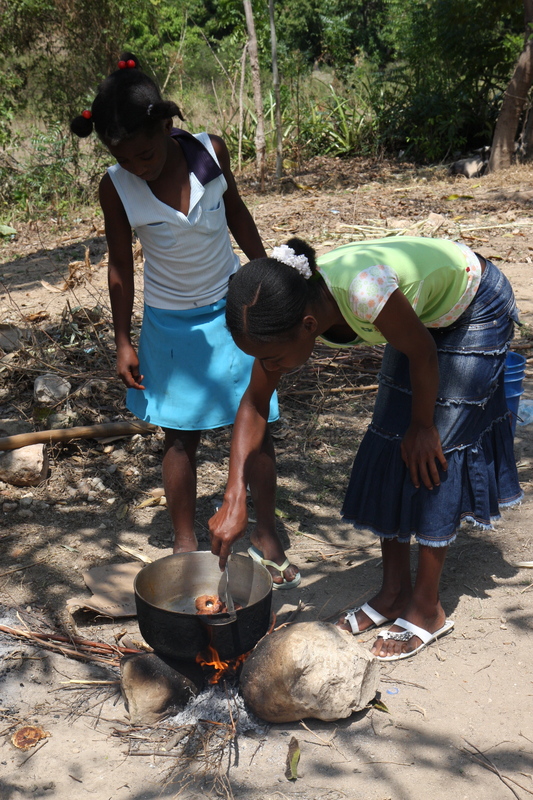 Thank goodness for these wonderful Haitian women, and bless their hearts for working tirelessly to feed us every day, and continuing to feed my colleagues on the ground as I write this. 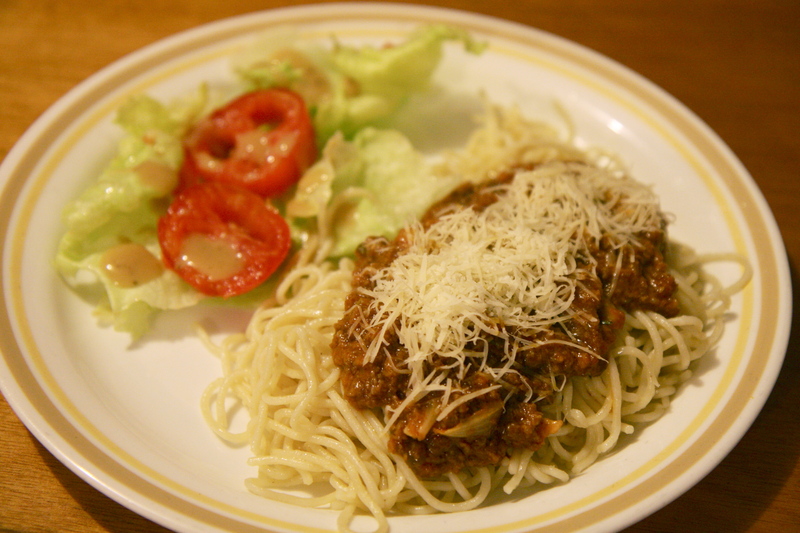 At times we got interesting renditions of popular Western foods, like pizza and pasta. 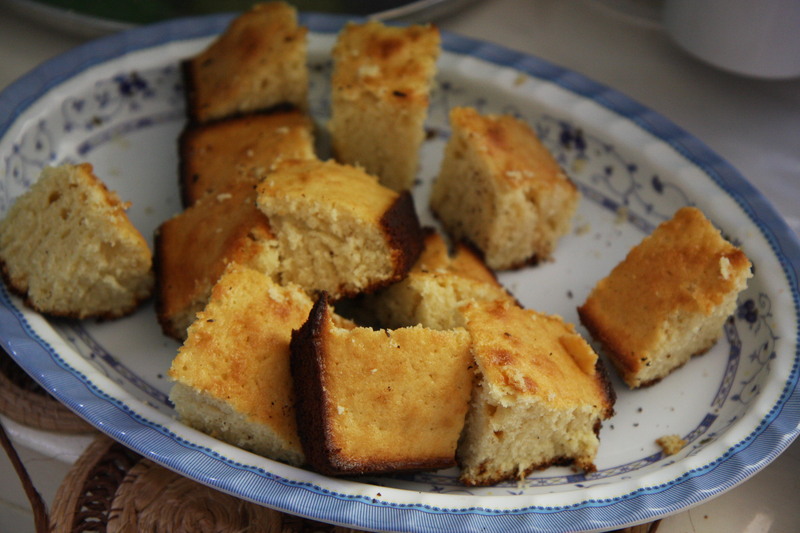 Many of these cooks have worked for NGO’s in the past, and have learned to prepare Western and ‘ethnic’ foods with local ingredients to please foreign palates. Spaghetti with peculiar variations of marinara sauce made frequent appearances at breakfast time, although I later found out that this was a common Haitian meal to start off the day. While I was in Liberia, one of our Liberian cooks even knew how to make kimchi, as his previous employer was the Korean embassy. He was more than eager to show off his pickling skills, and he always made a nice fresh batch of napa cabbage and radish kimchi for me. It was a surreal experience to be eating pretty good kimchi with fire-roasted armadillo meat and steamed cassava in the middle of the African bush. I almost feel embarrassed to share the fact that we were even spoiled with the occasional baked desserts, like pound cake and cookies. When I returned to the US, my friends took turns wining and dining me, thinking that I was living on dried crackers and breadcrumbs all month. I didn’t even expect to eat so well in Haiti, and I was secretly looking forward to losing some weight and being able to fit into my tight designer jeans, but alas, I weighed exactly the same when I came home. 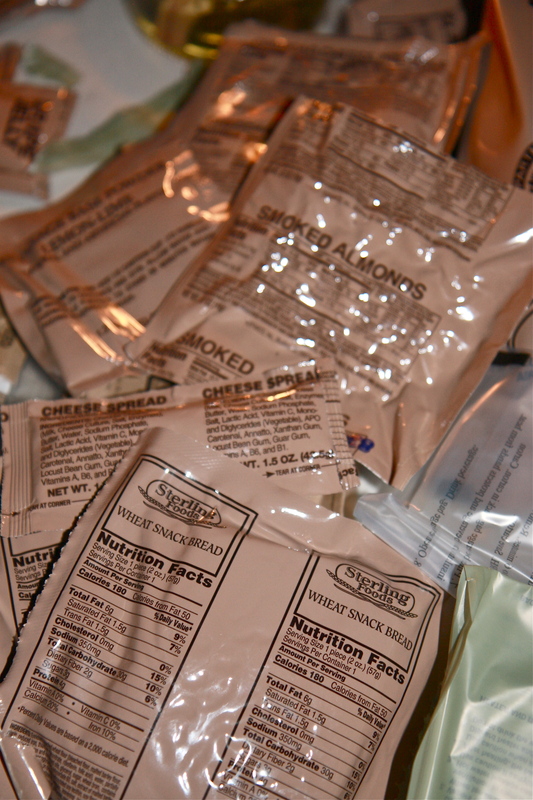 It doesn’t help that those MRE’s, formulated to sustain soldiers in combat, are incredibly high in caloric count. Marketplaces were slowly opening back up and food stalls started lining the streets during my time in Haiti. My culinary curiosity for local delicacies wanted to sample everything in sight, but my rational judgement held me back. Unidentifiable meats and questionable hygienic preparation meant a high risk of contamination with parasites and bacteria that could ruin me within hours. My sole purpose in going to Haiti was to assist in the rescue efforts- if I was sick, I was absolutely useless and it did nobody any good. 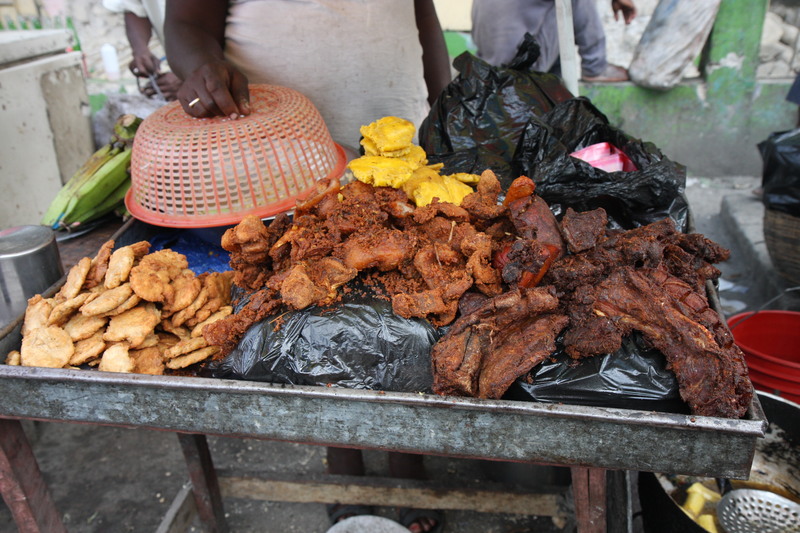 Everything sold in the markets was deep fried in an attempt to minimize harmful bacteria, but it wasn’t very convincing to see these fried products sitting out in the hot sun covered with a dense veil of flies and insects. Sausages and hot dogs were a common sight, but they were anything but Kosher. An interesting road side bar packed with unlabeled glass bottles of colorful liquids caught my eye, but I didn’t see any customers let alone a patron. The only thing that I did sample were some freshly fried donuts run by a couple of young girls near a mobile clinic that we ran one day. They weren’t Krispy Kreme quality, but with mashed bananas and lots of sugar inside, they really hit the spot. 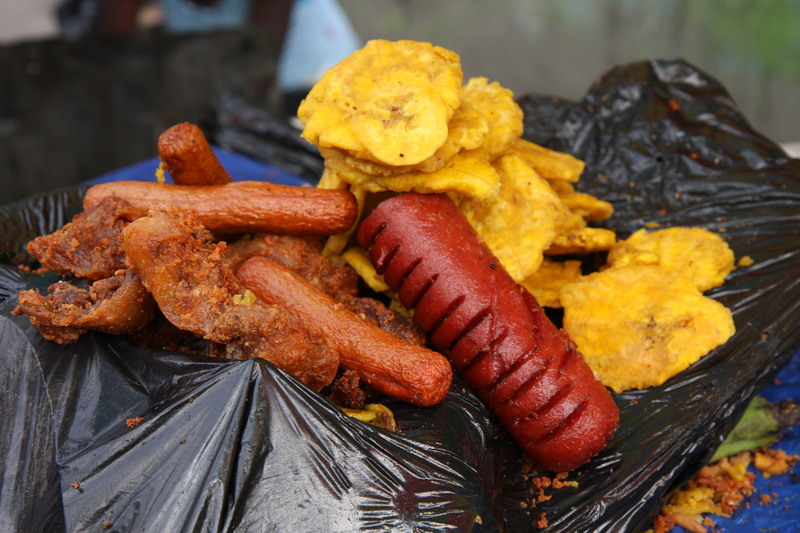 So that’s my answer to the ever popular question of “What did you eat in Haiti?”. Contrary to what people envisioned, I didn’t have squirrel intestines or fire roasted centipedes, or pick beetles out of fallen tree barks. It’s amazing how people’s imaginations run wild when they have little knowledge about the culture and history of a developing country. One of these days I’ll post an entry about the food that I ate in Liberia, West Africa during my first humanitarian mission. 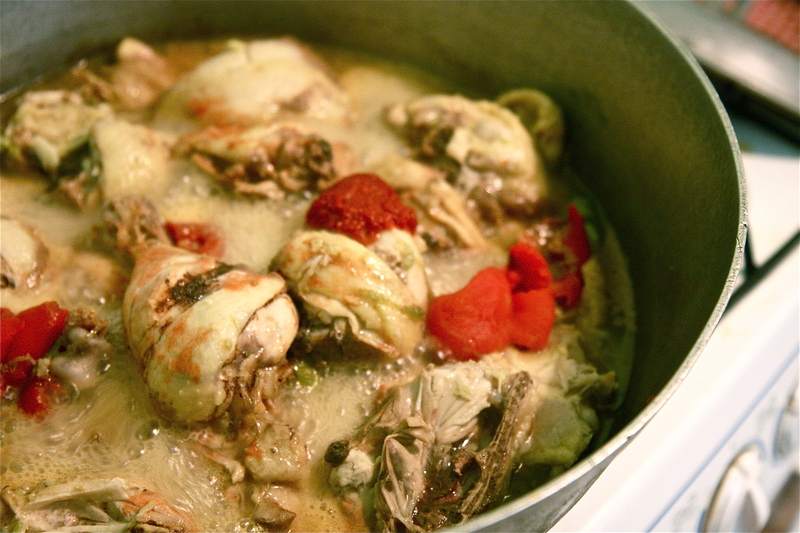 What I had there can easily produce an entire season of Bizarre Foods. For me, it was a warm and comforting bowl of pho. 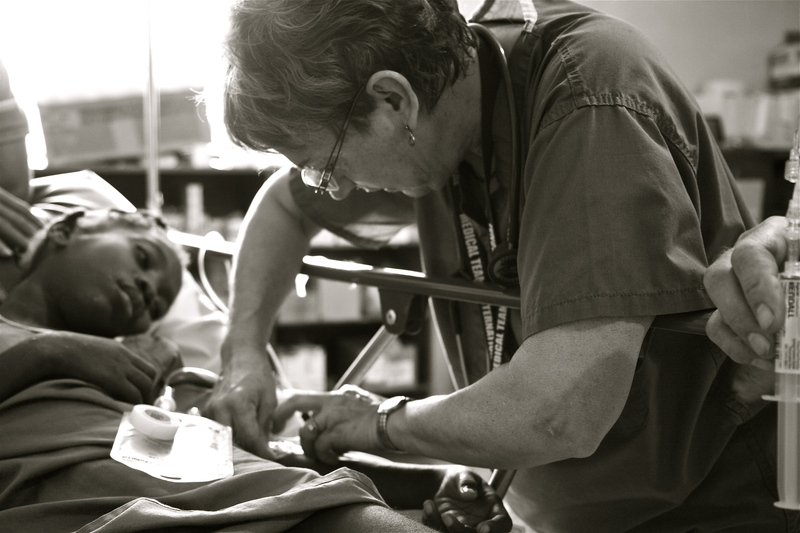 This medical mission to Haiti was a particularly challenging one, right from the beginning before I even left the US. 2 days before my planned departure, I received news that one of the nurses on ground from the team that we were replacing, had died unexpectedly. This devastating news shocked all of us, and for a moment it weakened my determination and motivation to go. 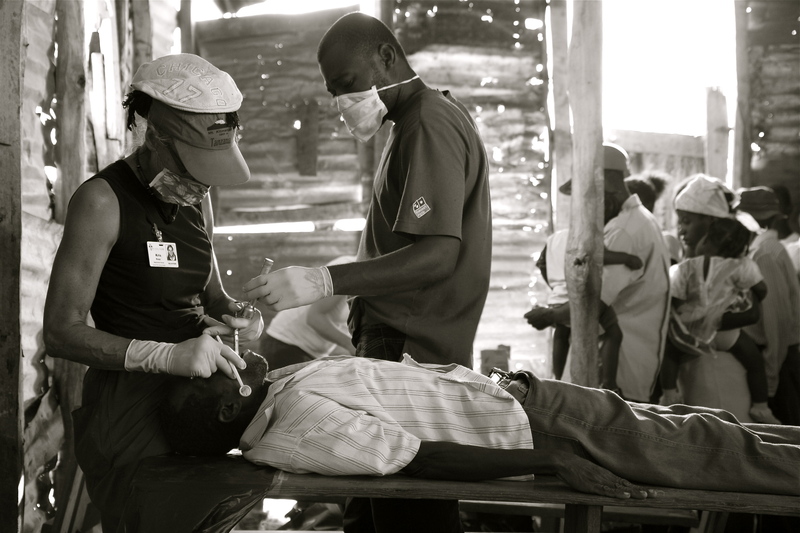 It’s not uncommon for aid workers to get injured or die in the field, as aid projects are often conducted in unstable and destitute environments. Death from disease and road accidents, and even kidnappings and executions are rampant. One of the aid organizations that I worked with had to temporarily close down their projects in Afghanistan and Somalia due to such atrocities. Even while I was in Haiti, 2 aid workers from another medical organization were kidnapped from a small town west of Port-au-Prince. Luckily, my team remained healthy and unharmed during our month, but the incoming team that replaced us suffered a big blow from their first day in Haiti. One of the nurses fell and broke her leg, necessitating medical evacuation back to the states for surgery. We all go into this well aware of such risks, but we still go because we believe in the work. 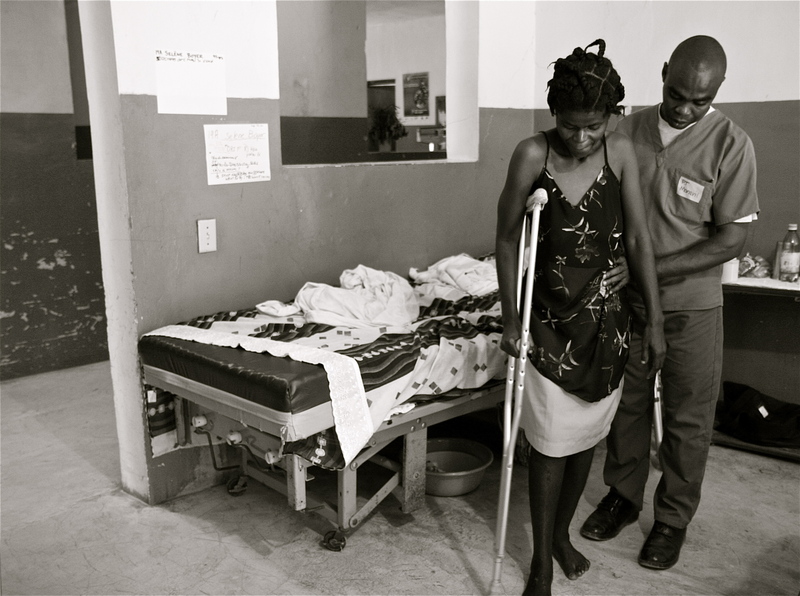 I arrived in Haiti after the immediate post-earthquake crisis of treating acute crush injuries had plateaued. Many earthquake victims suffered orthopedic problems due to fallen rubble, like fractures, compartment syndrome and lacerations. 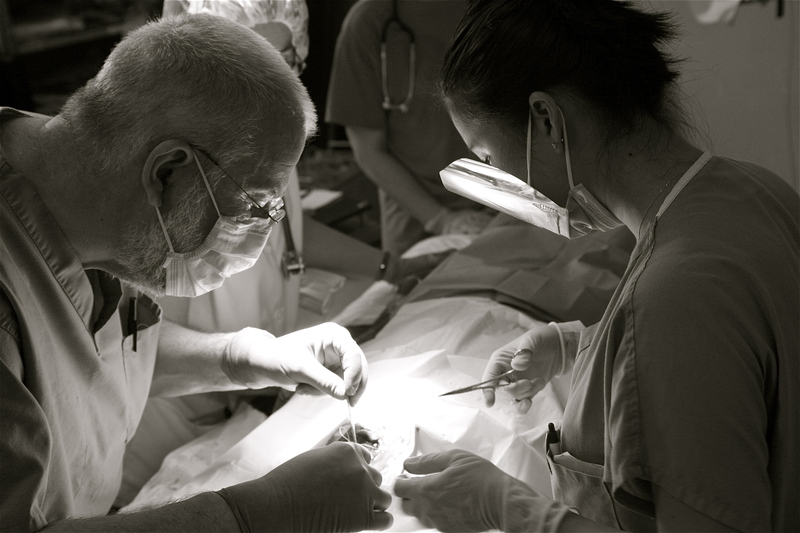 Emergency limb amputations were being performed under sub-optimal conditions due to the fact that everything had been destroyed in the earthquake. 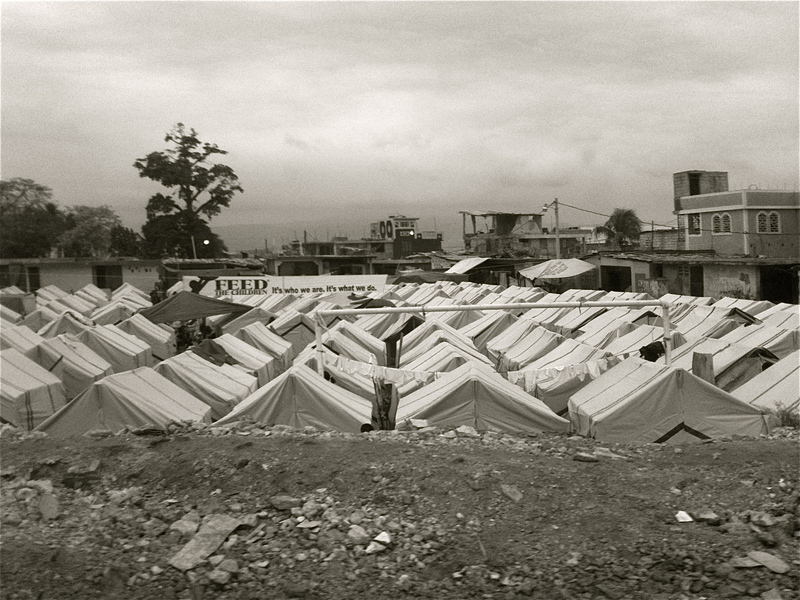 Temporary hospital tents and tarp were set up in whatever space could be scavenged in lieu of the concrete medical facilities which had been reduced to powder. Along with the buildings, the earthquake also took with it all functioning medical equipment, medications, and even hospital staff. 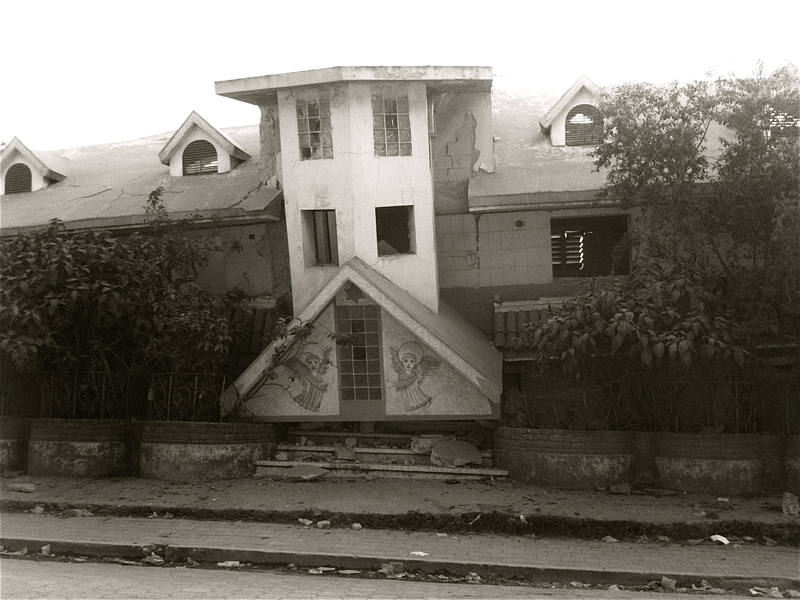 Every working hospital and clinic in Port-au-Prince had collapsed with the earthquake, and there weren’t any buildings left that were usable. Over 200 international aid organizations responded to the 7.0 magnitude earthquake and descended upon this tiny island nation with aid workers, equipment and numerous other resources. I was amazed to see some sophisticated tents, 2 stories high and sturdy as hell, set up by various medical groups as their new hospital grounds. 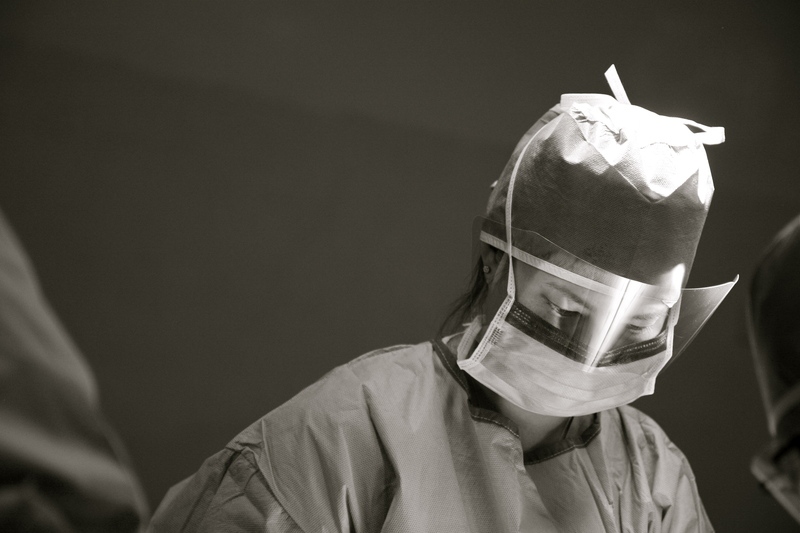 All types of medications and anesthetic equipment were shipped over to perform complex surgical procedures. Still, many victims who couldn’t access these facilities were treated in the acute crisis phase with life-saving amputations often without any type of anesthesia or proper post-operative care. The situation was desperate in the first week following the earthquake, as chaos and improper coordination caused a delay in foreign aid workers being able to enter the country. 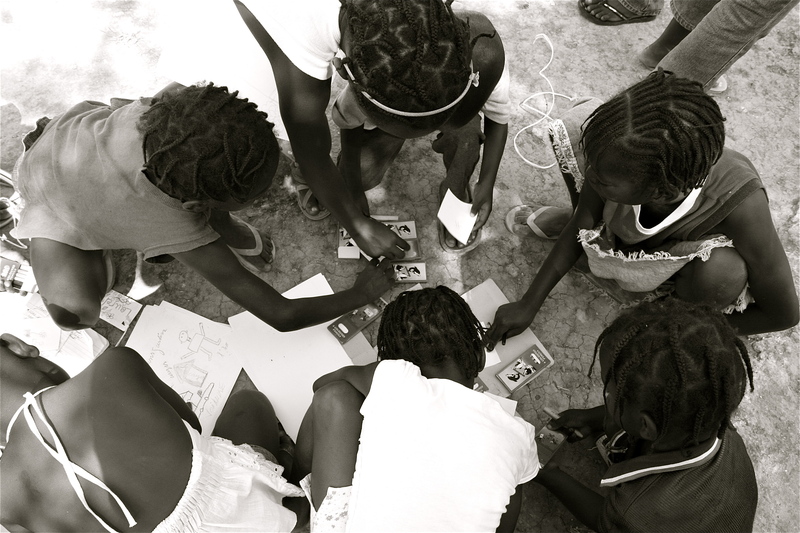 My month in Haiti was split between 2 projects in 2 different locations. 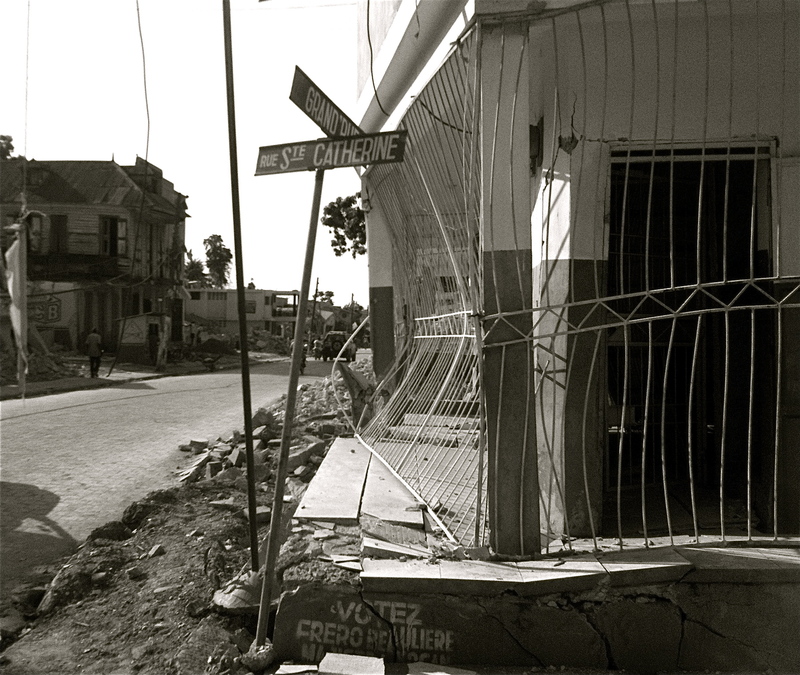 The first half was spent in Leogane, the city closest to the epicenter. The drive out to Leogane was a haunting one, as we whizzed past replaying landscapes of crowded IDP (internally displaced persons) tent camps and demolished concrete houses. Not a single building in the area was spared in this earthquake, and there was rubble and garbage everywhere on the streets. Road traffic was dominated by hefty 4×4’s displaying NGO stickers of organizations from all over the world. Every partially intact building or large tent facility was clearly labeled with NGO flags and signs- the foreigners had moved in and taken over all operations in the country. It was a lively international scene of expats from all over the world. 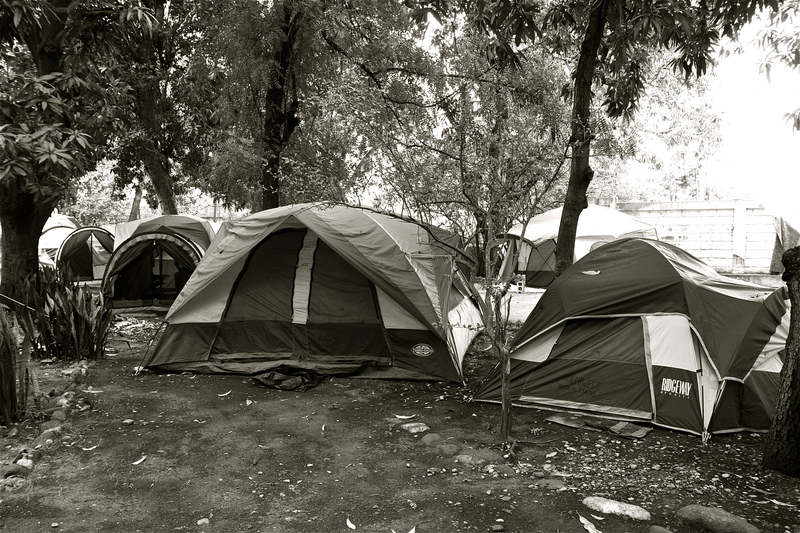 We shared a campground with Americans, French, Dominicans and Canadians, where tents of all sizes and shapes crowded the small grounds next to an old factory that we now used as a warehouse to store medical supplies. 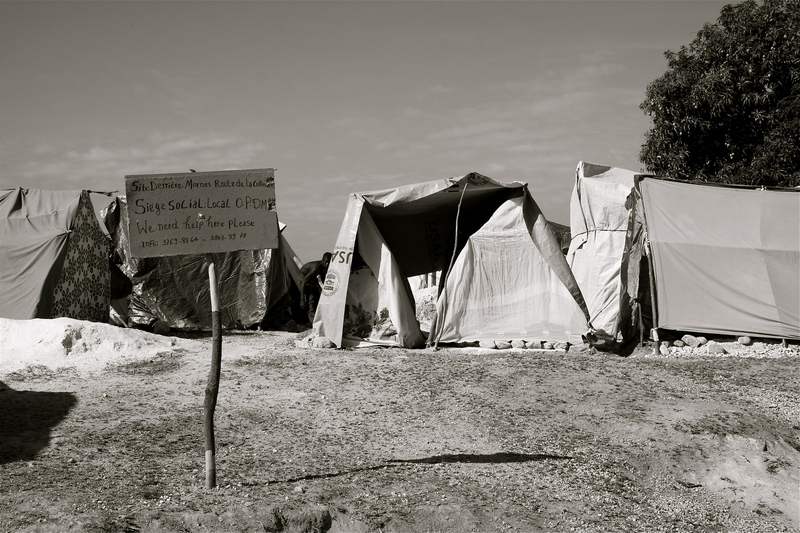 Even though we lived frugally, with limited electricity from a gas-run generator and bathing water from a local well, our camp life in the expat quarters was luxurious compared to the harsh reality of living in an IDP camp for millions of displaced Haitians. 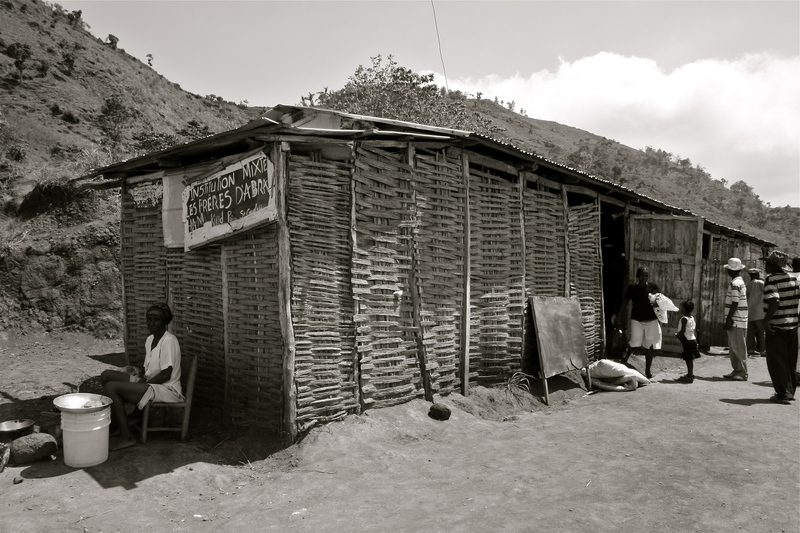 The project in Leogane concentrated on running mobile clinics to reach hard hit areas. Collapsed streets and bridges made transportation difficult, isolating remote villages even further from medical help and resources. Here, in these small quaint villages that were affected by the tragedy, was where I encountered my first slew of unbelievably sad and upsetting stories. Every patient that we saw had a tale to tell of the legendary few minutes when the earth violently rumbled on January 12th and swallowed villages, people, livestock and buildings whole. 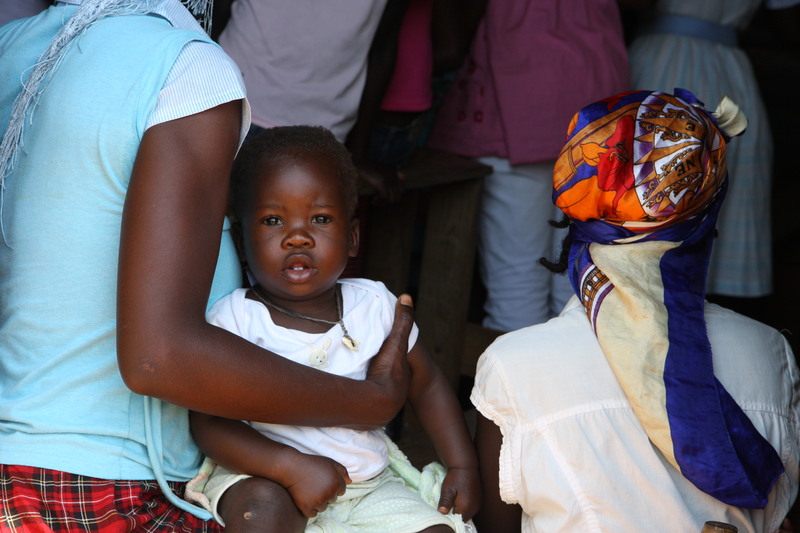 One young woman came with a malnourished and weak baby wrapped in tattered blankets. Just before the house collapsed, the baby’s mother threw the baby out through the window in a desperate lifesaving move before being crushed, along with the other family members, under heavy concrete blocks. This young woman, a very distant relative of the family, who became an orphan herself, took on the role of caretaker. There were many problems though- she couldn’t breastfeed the baby, and she had no money to buy infant formula. She didn’t even have money to feed herself. Caretaker and baby were both malnourished and poor. We gave her diapers and cans of infant formula, along with medications for the horrible diaper rash that the baby had, but with no money or shelter, what was to become of this new family unit? What were we doing handing out temporary band-aids to grave situations if we couldn’t guarantee a secure future for anybody? Although our presence and care undoubtedly made an impact to these people in need, I couldn’t help but feel like our efforts were futile. This is why many aid workers leave the field and go into public health and foreign policy. Skin infections dominated clinic visits, as practically every other child presented with a severe case of scabies. Poor hygiene in crowded and dirty living conditions subjected every vulnerable human to a slew of dermatologic diseases, and my heart ached each time I handed out tubes of medication, knowing that these remedies would only hold for so long. Even if these horrible rashes cleared up with my prescriptions, the slum life would inevitably manifest on their skin in a couple of weeks. What we were doing was important, but what really needed to be done was to remove everybody from the crowded camps that had scarce latrines filled with putrid feces, and get them into houses with clean potable water and sanitation facilities. But this was going to take years, maybe even decades. 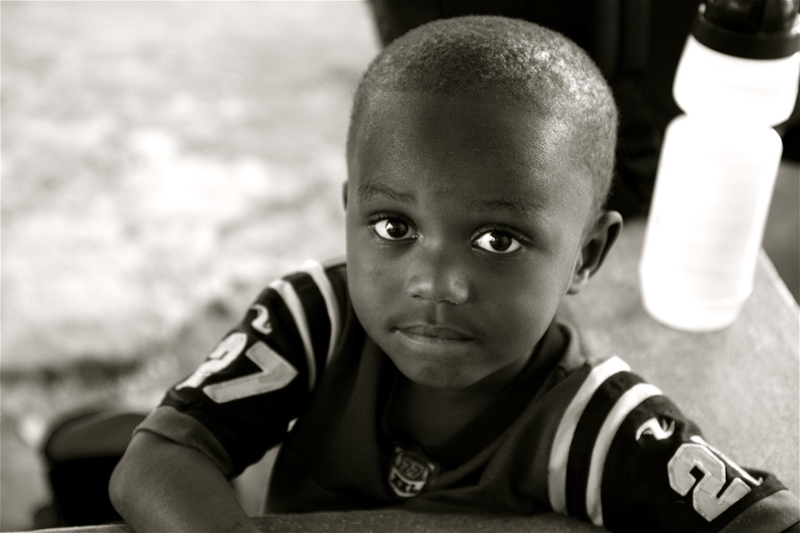 As much as the people of Haiti felt helpless, we did too. 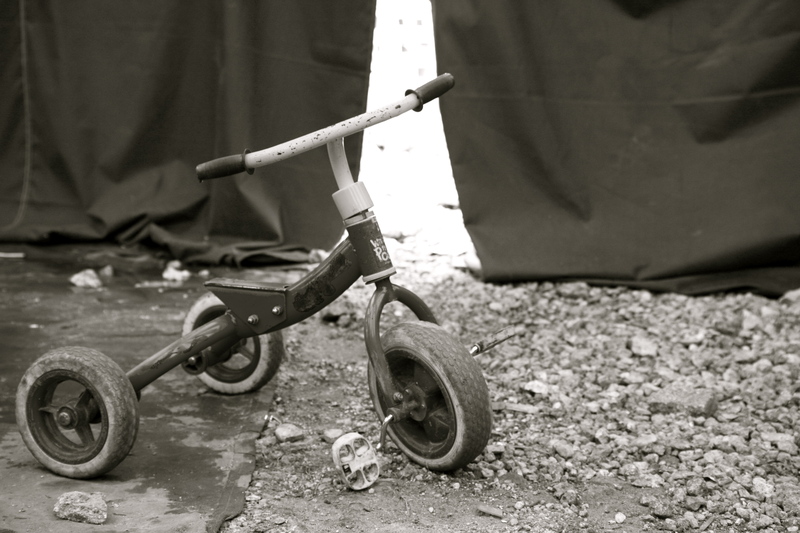 Trips to local orphanages left me with a mixed feeling of hope and sadness. Some of the children in these facilities were orphaned by the earthquake, but the majority were already there before the disaster. 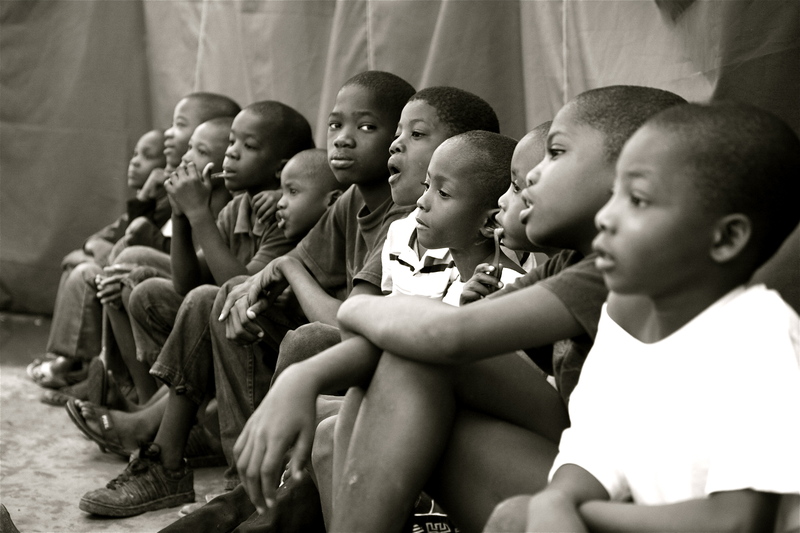 My naive eyes were jolted to a reality that in Haiti, many children in orphanages still have living biological parents who had no choice but to give them up due to extreme poverty. 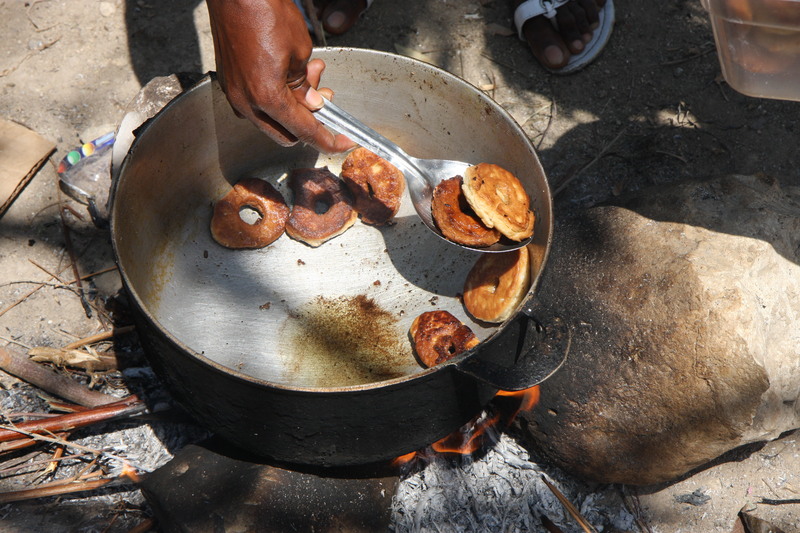 This is a common and accepted practice in Haiti, which is the poorest country in the Western hemisphere. 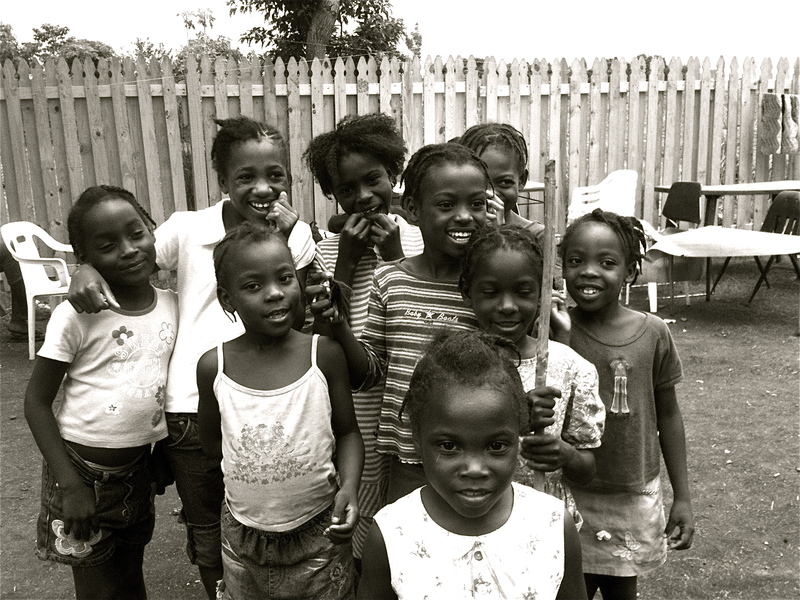 They’re better off here than being sold off as slaves, the orphanage coordinator told me, and I silently wept for the hundreds of child slaves who were desperately surviving on the dirty streets of Haiti, stripped of their innocence and happiness. The reality of life in developing countries, so vastly different from our own defined by creature comforts, always hits my conscience with a painful thud. 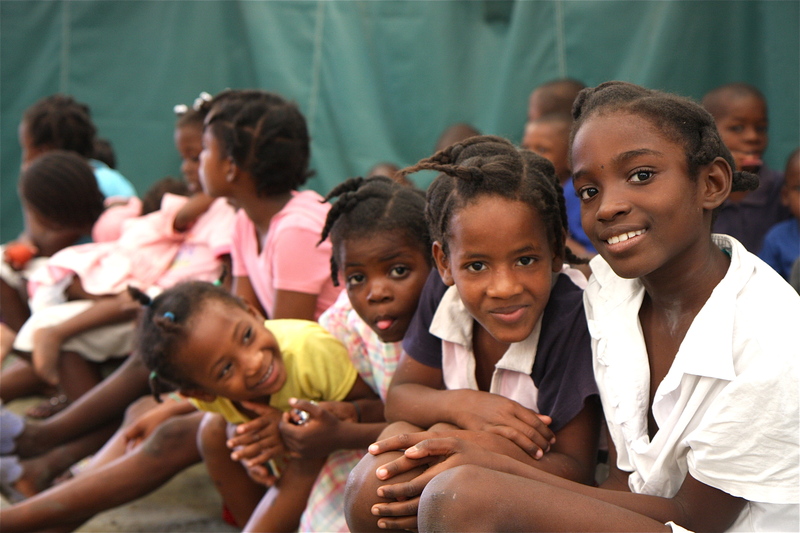 What was to become of these children and their future, if 3/4 of Haiti’s schools were now in ruins due to the earthquake? How can they be expected to lead Haiti into a brighter future if they can’t even get a proper education? These children were starving for games and activities. They needed stimulation, just like any child deserves. It was fascinating to see their eagerness and fervor as they all played with the balls, hula hoops and balloons that we brought. Their eyes lit up as they grabbed the paper and crayons we provided and drew pictures and scribbled words with ferocious intensity. 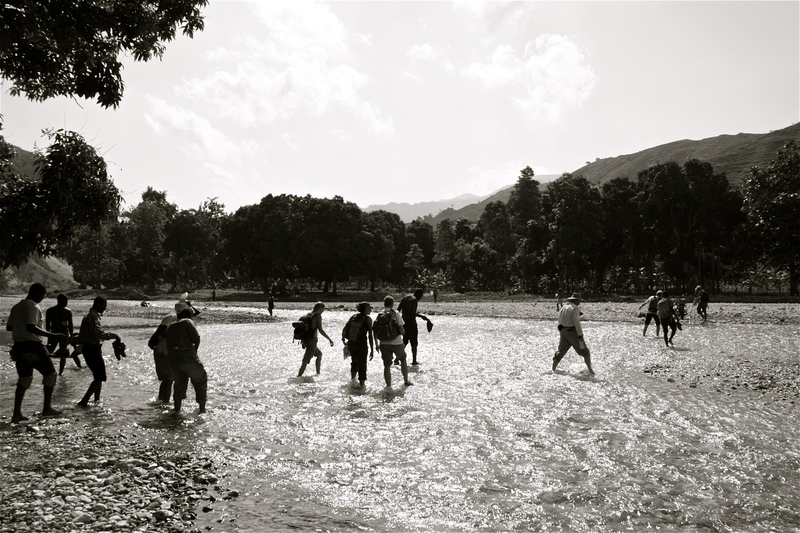 For the first time since the earthquake, they were able to just be children. At times we crossed rivers, climbed tall mountains and rode mules and donkeys for hours under the beating sun to reach remote villages. These long and treacherous journeys wore us down both physically and mentally. 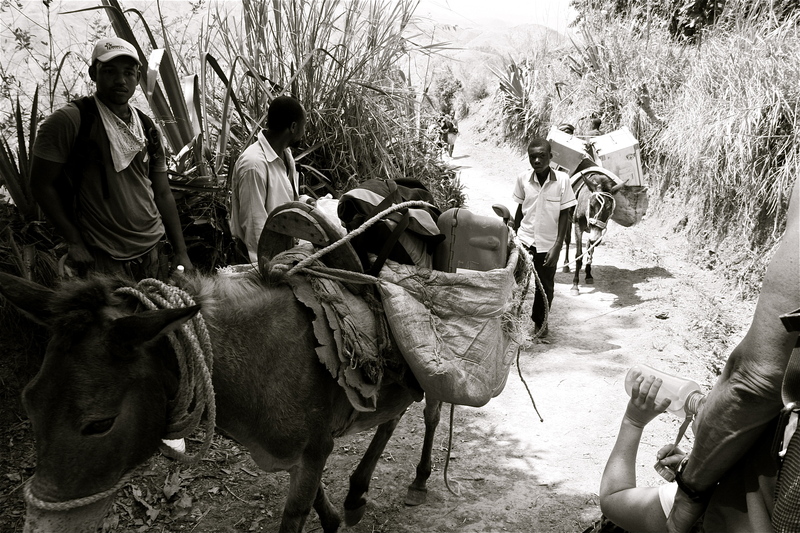 Long hard days weren’t easy, but it was nothing compared to what the people of Haiti had gone through. It was this determination that kept our adrenaline going every day. Although we were tending to patients in dire need of medical attention, it was quite apparent that the majority of cases were not directly related to the earthquake. 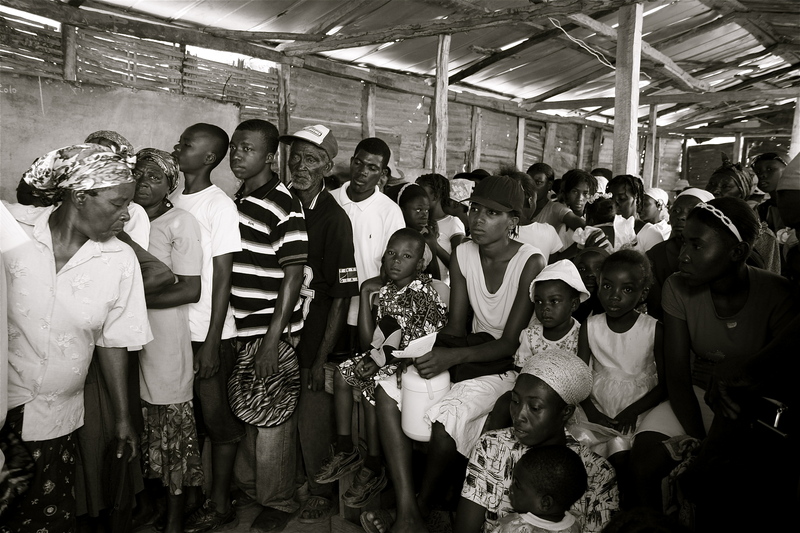 The immediate crisis phase of life saving procedures and amputations had passed, and we were now treating chronic problems that had gone untreated simply because of the inefficient health system in Haiti. After all, even before the earthquake, international medical organizations were running several hospitals in the country to augment the feeble national health care system. This sparked a huge debate among our team every day. 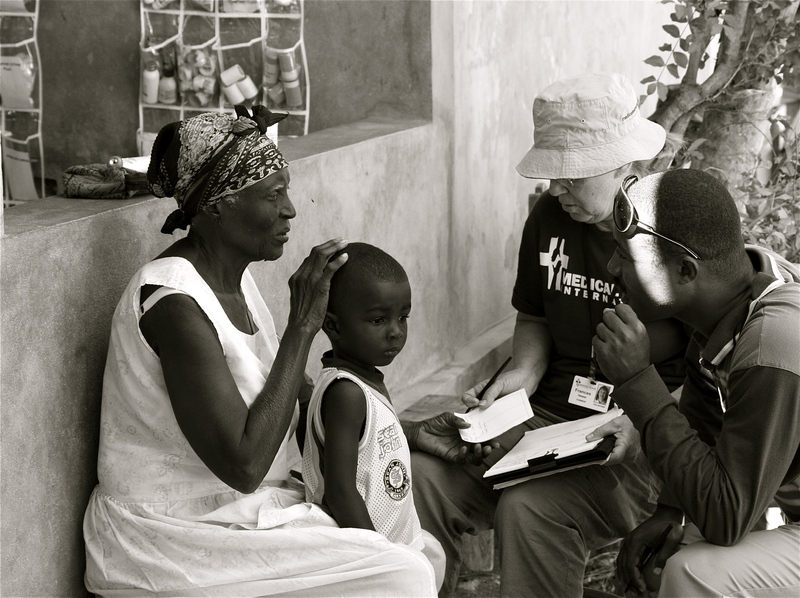 Non-native doctors and nurses were now running the show in Haiti, and NGO clinics had completely replaced any existing Haitian medical system. People were flocking to these clinics to take advantage of the opportunity to see the ‘good white doctor’ and get medications for free. And now that the crisis phase is over, many of these foreign organizations will inevitably pack up and leave very soon. Then what? Who is responsible for laying out the long term blueprint for rebuilding the health care system, and who is obligated to see it through? Much of my previous humanitarian work involved teaching and training of local practitioners to help establish a more competent and internally-run system. It didn’t make sense to me that we were coming in, passing out medications, and leaving. But Haiti was different. This was a natural disaster of unprecedented proportion, the worst that all aid workers have ever witnessed. The one that claimed more than 230,000 lives and displaced more than 1 million people. 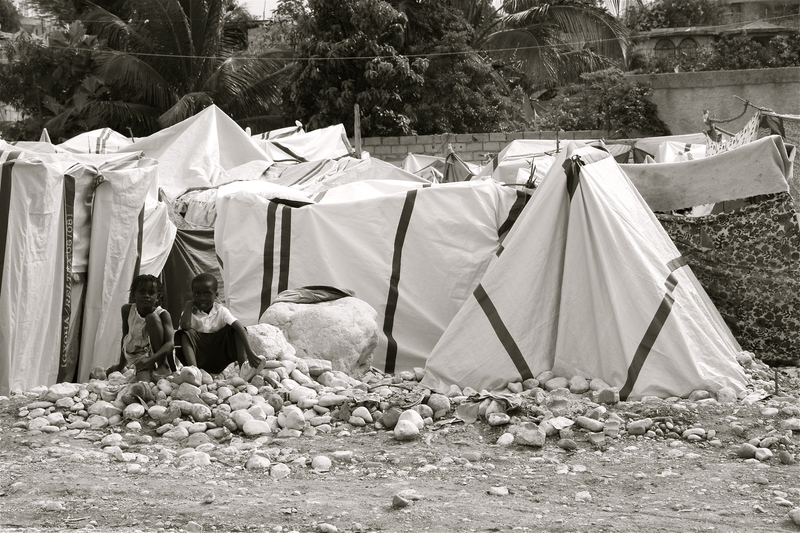 How can we start the process of education and training to the few Haitian doctors and nurses who survived the quake, who themselves have become homeless and were still grieving from the death of family members? One of the Haitian doctors that worked with us, Dr. Spencer, was living with his family under a sheet of tarp when he hired him. He was the only survivor in his neighborhood. Carol, a Haitian nurse who worked with us, told us that the nursing school she graduated from had completely collapsed. Classes were in session when the earthquake hit, and the entire 2nd year class of nursing students and the professors conducting the class, died. How do we rebuild this country that has literally lost everything? These thoughts consumed my every waking hour as I took a propeller plane to Les Cayes for the second half of my medical work at the Bonne Fin surgical hospital. Due to the remote location on the southern part of the island, this area wasn’t affected by the earthquake. 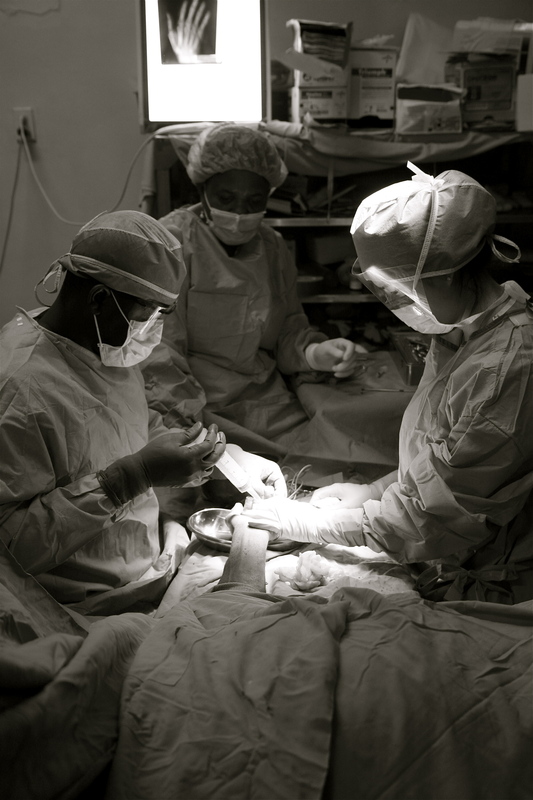 This longstanding surgical hospital, equipped with sophisticated operating room facilities (for a developing country, that is), served as an optimal referral center for complicated orthopedic cases that were untreatable in Port-au-Prince. The rooms were overflowing with trauma victims who were directly affected by the earthquake. Here too, I met many courageous people who all had a story to tell. 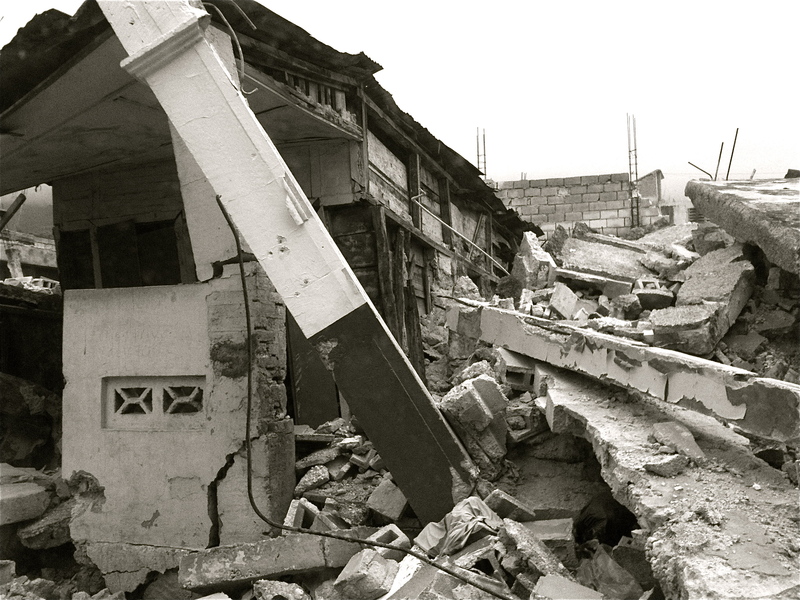 Josephine, an 8 year old girl, was trapped under the rubble when her house collapsed. For 18 hours she couldn’t move, as her right leg was wedged under a heavy piece of concrete. There she lay for hours on end, unable to even move her head away from the horrific sight that was directly in front of her. Her pregnant mother’s lifeless arm was almost within reach, and she could see the back of her sister’s head in the distant rubble, but it never moved and she never heard a reply when she called out to her. Her other sister was nowhere to be found. Her father, who was away for work, was still alive and he made it back in time to pull her out of the rubble. She survived, but eventually had to get her gangrenous right leg amputated. She suffered other open fractures which got infected and had to be cleaned in the operating room daily. Every day was a repeat cycle of more procedures and more pain. These were the stories that haunted every patient we treated, and these were the reasons why we were busy performing many surgeries every day. Despite the modern facilities at this hospital, it was still nothing compared to hospitals in the US. With almost every patient that we treated, it was obvious that they would have had a better chance of recovery if they were treated in the US. Take one of our head trauma patients, for example. It was apparent that this young man, who suffered a severe blunt blow to the head from the fallen rubble, had a skull fracture with cranial bleeding. How did we treat him? With observation and intermittent sedation for extreme agitation. In other words, we watched him die. If we had neurosurgeons and neurosurgical operating rooms, this guy may have had a chance at meaningful recovery with a good quality of life. Ventilators and heart monitors in ICU rooms would have made his post operative recovery smooth. A CT scan would have helped to give us a diagnosis. Even if his injuries were inoperable, oxygen would have helped to ease his agonal breathing in the final stages of his painful life. A touch of morphine would have decreased his suffering to make a comfortable transition into the afterlife. 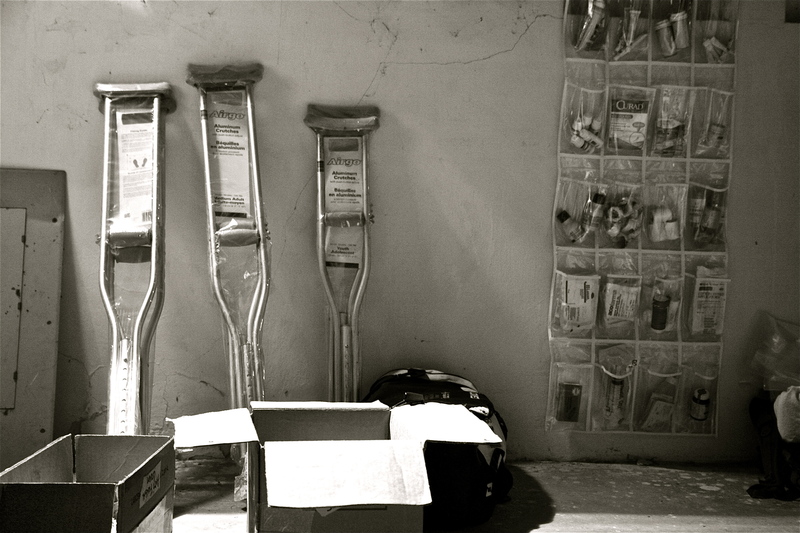 But we barely even had enough morphine for those who needed their fractures reduced. With limited resources, we were having to make decisions on which suffering patient deserved things the most. This responsibility was one of the heaviest burdens of the job. Who are we to call the shots and decide who deserves what? Every evening I crawled back to my bed, completely exhausted, with an uneasy feeling in my chest. Still, miracles do happen, and we performed many life-saving operations and nursed people back to good health. We even managed to evacuate 2 Haitian girls to a university hospital in Texas to get specialized operations for their complicated fractures. This is what makes the work worthwhile, and this is the joy that feeds my motivation to keep going. 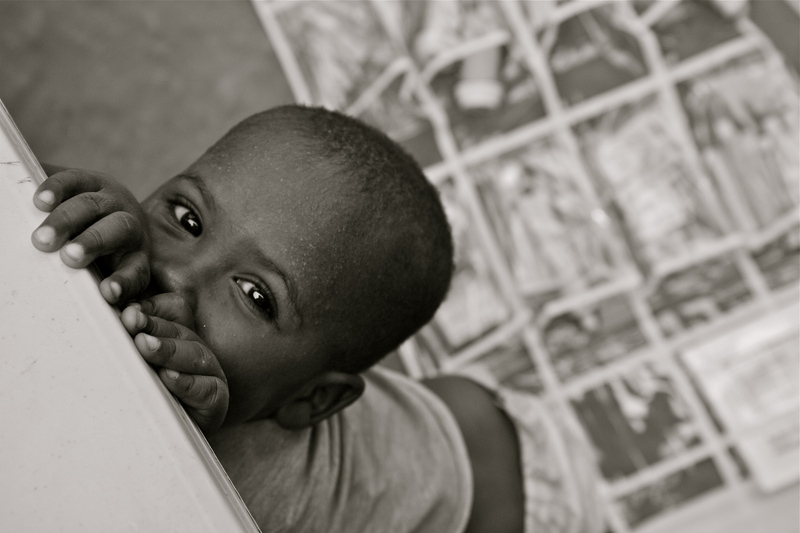 A simple smile from a child is all it takes to make my fatigue disappear. “It was an interesting experience”, I say quietly, as I run through the images of crying children and suffering patients, and fight back my tears as I fake a smile. For an even more interesting insight into the life and the mind of a humanitarian aid doctor, go see the Doctors without Borders documentary called ‘Living in Emergency’, which is going to play in theaters nationwide on June 4th. This documentary was shot in my hospital project in Liberia right before and after my 7 month duty there, so it accurately depicts my personal experience in Liberia while I served with Doctors without Borders. Many of the doctors filmed in the documentary are my colleagues with whom I worked with in Liberia. 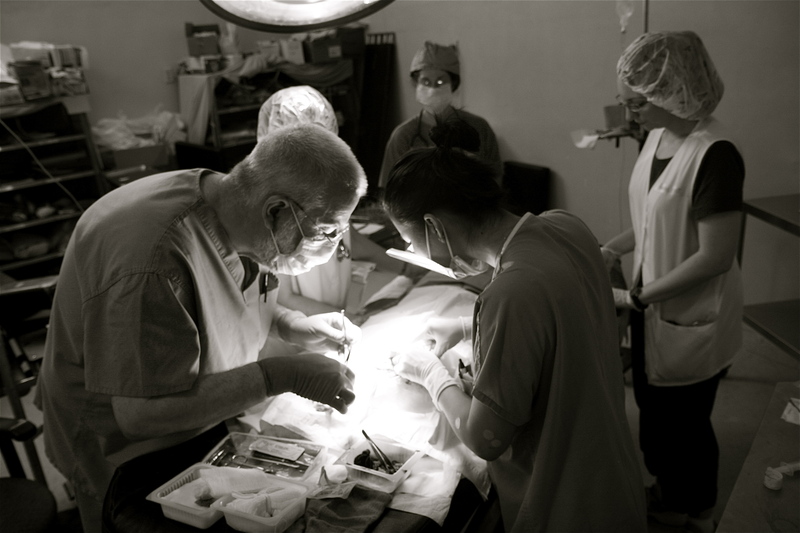 It’s a riveting and raw look into the intense life of a doctor in the field. 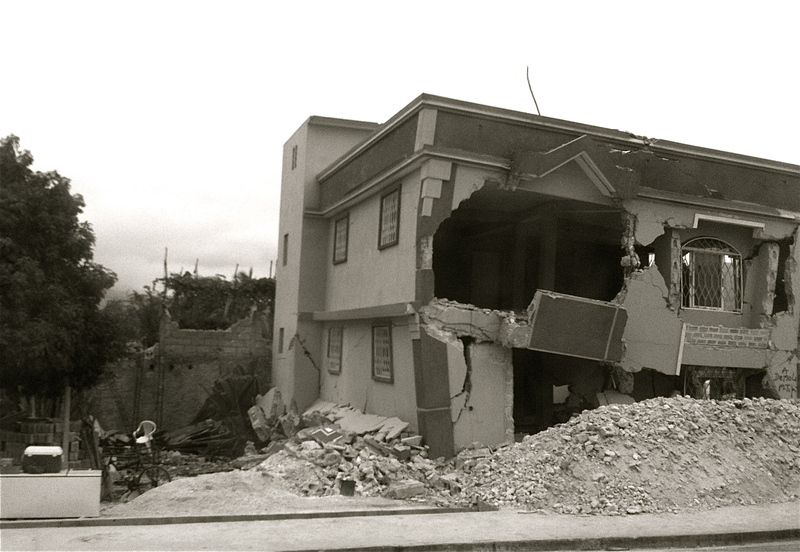 On Tuesday January 12th, 2010 a devastating 7.0 magnitude earthquake struck the small island country of Haiti at a depth of 8.1 miles. The epicenter was located 15 miles away from Port-Au-Prince, the capital city of this country known as the poorest country in the Western Hemisphere. Over 230,000 people are believed to have died from this catastrophe and 3 million affected, making it one of the deadliest natural disasters in modern history. No doubt you have all watched TV footage of the aftermath of the earthquake- of people with bleeding head injuries carrying their dead children in their arms, of corpses piled up on the side of the road, of lifeless limbs being discovered in concrete rubble as futile rescue efforts continued on through the nights, of millions of now homeless Haitians begging for food and water, of riots breaking out at food distribution points, and of understaffed medical personnel attending to an extraordinary number of trauma victims in makeshift hospital tents. It was a truly desperate situation for all involved and a tragedy of unbelievable proportion beyond belief. Not being able to do anything while watching all of the painful footage on the news was unbearable. 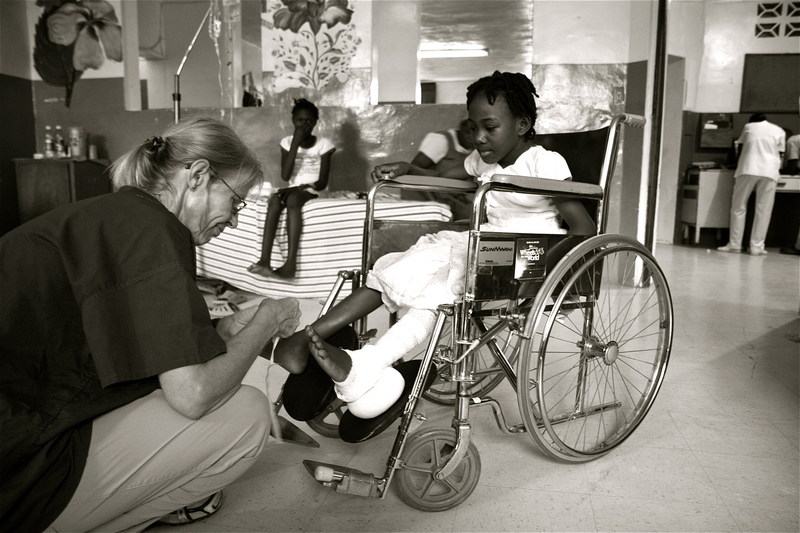 When I was called to go to Haiti for a humanitarian medical mission, I jumped at the opportunity. But nothing prepared me for what I was about to witness. I went with an international medical organization that has many years of experience working in both natural disaster and conflict settings. Doctors, nurses, EMT’s and physician’s assistants made up my team of disaster response personnel who flew into Port-au-Prince. 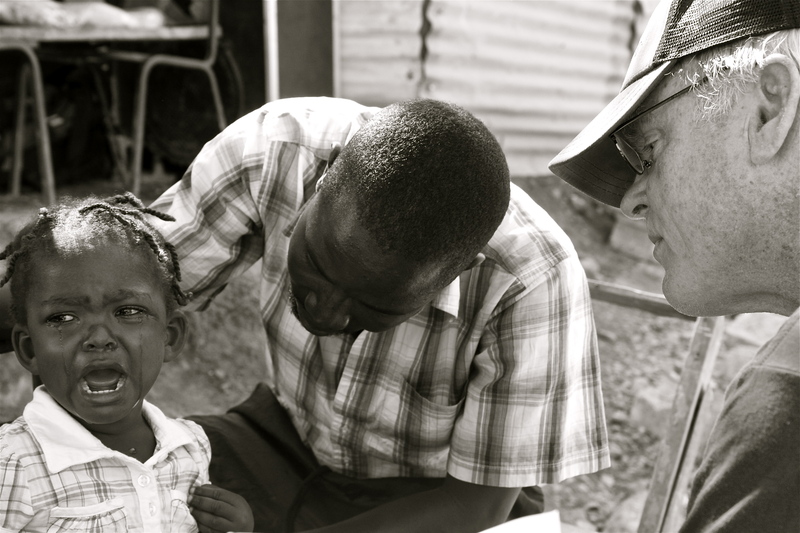 Until the time that we went, 12 such teams had already rotated through various cities in Haiti to attend to the massive medical needs that ensued after the earthquake. 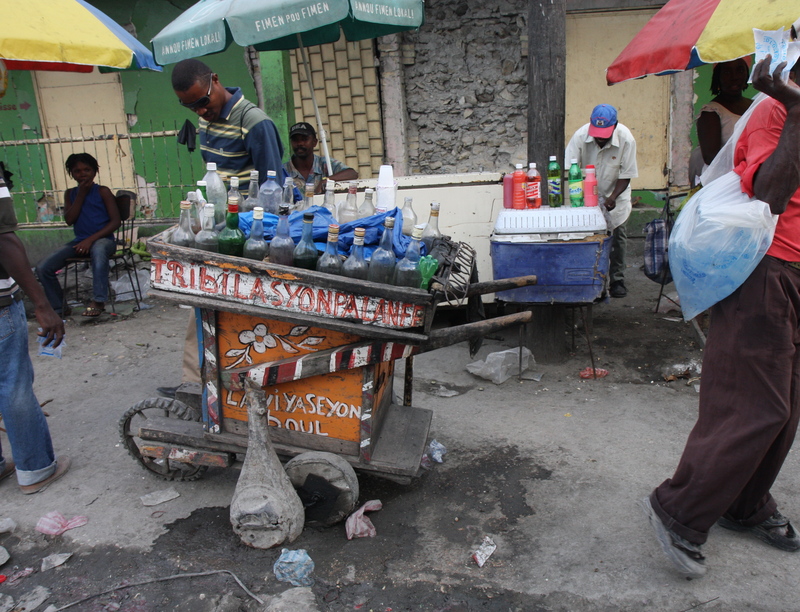 On the day that we arrived, we were taken through a tour of the central part of downtown Port-au-Prince where we all watched in shock at the wreck that once used to be a bustling marketplace. Not a single building or house was left unscathed, and there were piles of rubble and debris everywhere. Statistics quoted that 300,000 houses were destroyed in the earthquake, but I wondered if this was a huge underestimation. 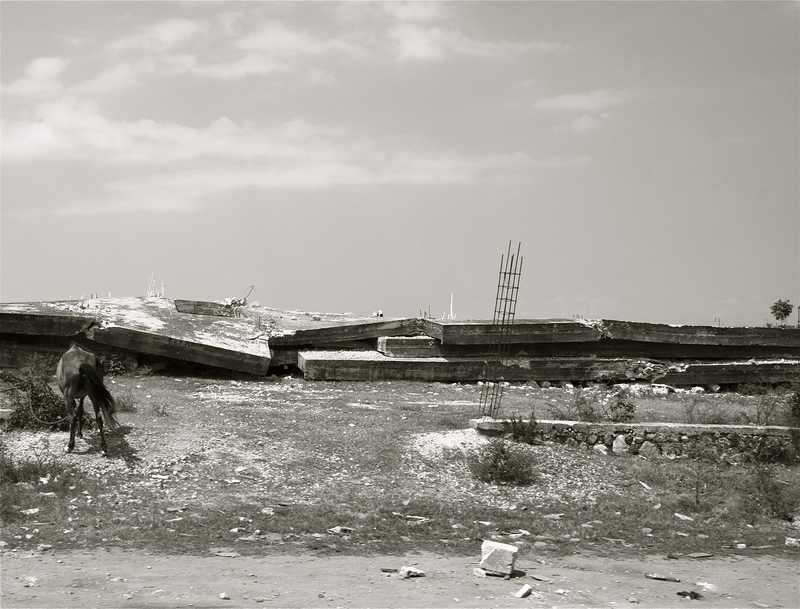 By the time I went to Haiti several weeks after the actual earthquake, the corpses had been removed from the streets and buried in mass graves, but there were still unidentified bodies trapped inside of the rubble that people have not been able to dig out. 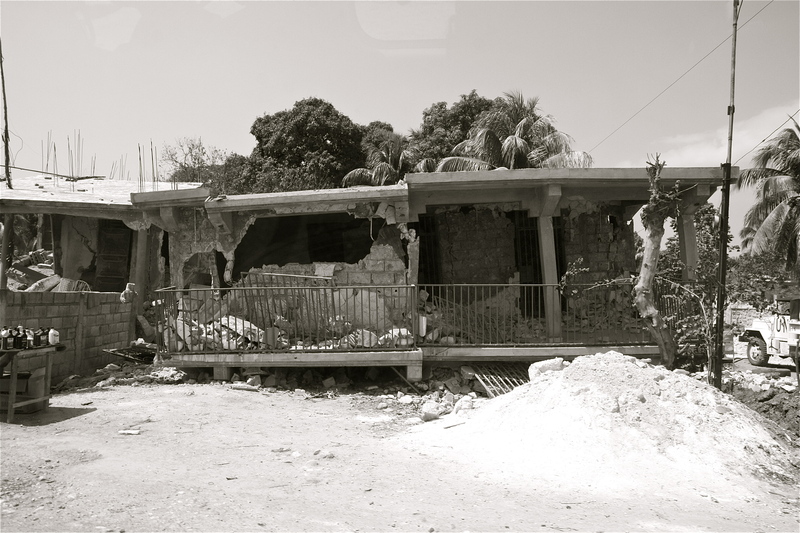 As we got closer to Leogane, the city closest to the epicenter of the earthquake, the scenery became more frightening. 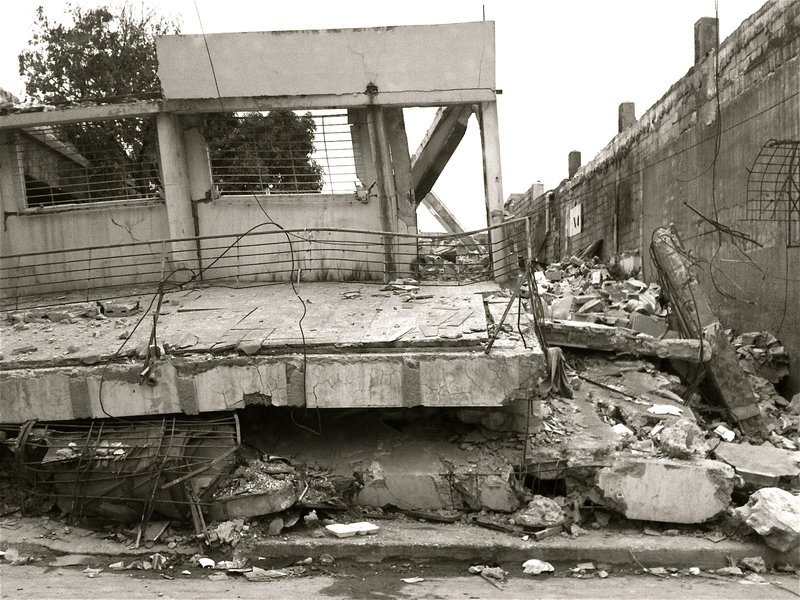 Large concrete buildings were squashed flat to the ground like a pancake. 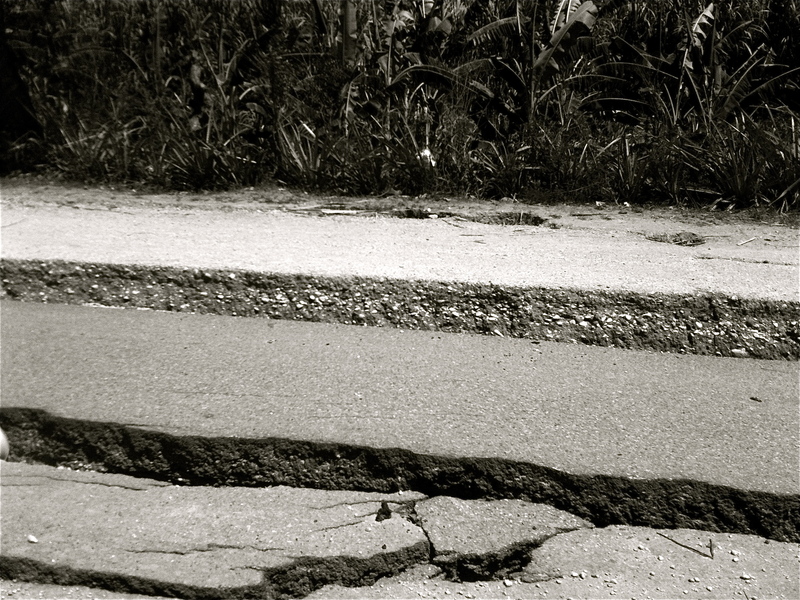 Large deep cracks penetrated the paved roads and iron gates were bent in half from the weight of fallen houses. What looked like intact buildings were actually the 2nd or 3rd floors of those buildings which had completely collapsed onto the ground floor. It literally looked like an atomic bomb had exploded and took everything with it. Although the immediate needs of the people were food, water and health care, eventually the need to remove the massive amounts of debris will have to be addressed. Unless the debris is removed, people cannot return to their home areas to start the rebuilding process. There was a lot of activity in the city, but the sadness and grief felt by all who had experienced this grave tragedy was painfully palpable. There was a sense of desperation in the air- a desperation to come to terms with what had happened, a frenzy to find food and water, an anxiety to search for a will to live and a worry of whether there was a future to look forward to. After the earthquake squashed everything down to the ground, the ravaged cities and towns were now overflowing with an extraordinary number of IDP camps (IDP means internally displaced persons). 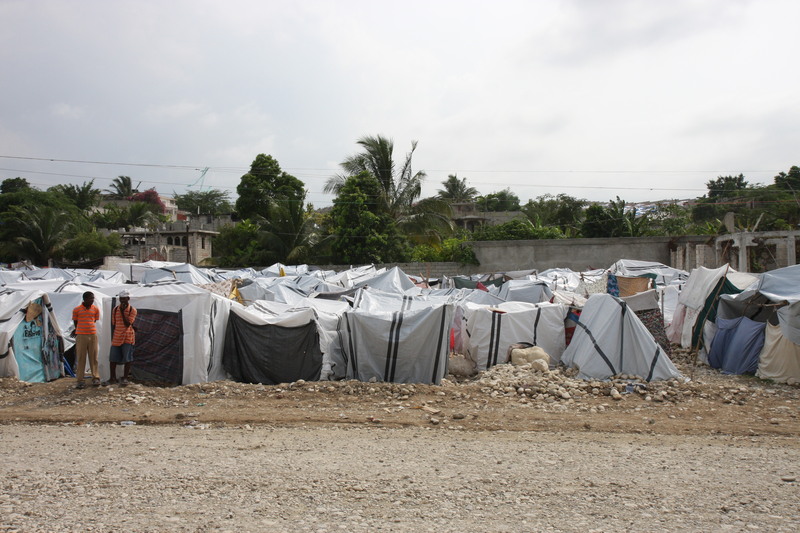 Approximately 1,500,000 Haitians are living in tent cities, but many more are still in need of shelter. Some of these shelters that were provided were sturdy camping tents, but many were tarps that were tied to sticks with a rope. A lot of makeshift homes that I saw were old torn up cotton sheets tied to wooden sticks that were barely holding up to the wind. How are these people surviving right now through the rainy season? By the time that I finished my month long medical mission, the rainy season still hadn’t started, and this was a growing concern among the aid community. 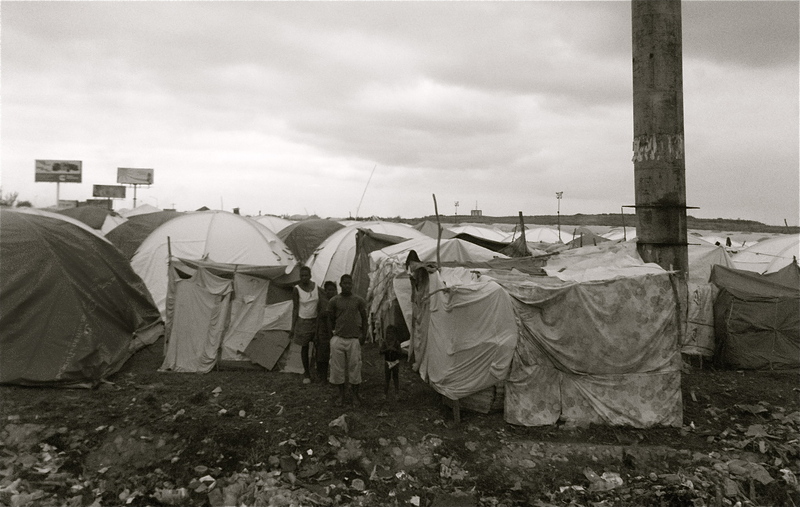 Providing waterproof shelter materials was one thing, but with entire families living in a tent or tarp shelter, and with hundreds and thousands of such tents in an IDP camp in crowded conditions, what was to become of sanitation and hygiene? And who was assessing and addressing drainage and solid waste management? Imagine living in a tent as small as your bathroom with 5 other family members, and living in a camp with 2000 other people with hardly any space in between each tent. Now imagine feeling hungry, thirsty and tired. You are also still recovering from the shock of watching your brother and sister die under the collapsed house. On top of that, your baby is malnourished and sick. Your other child has had diarrhea and vomiting for 5 days. There are only 2 latrines for the entire camp, and both of them are overflowing with feces. This was the reality of life in these camps. No human being deserves to live like that. Everybody was suffering from the psychological trauma of living through the earthquake and losing not only their loved ones and their homes, but also their sense of identity and hope. 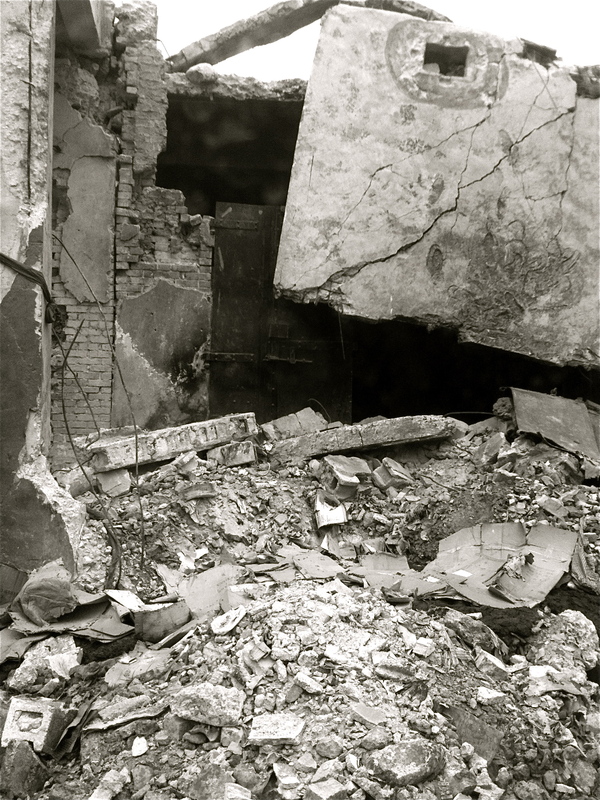 In addition, there were numerous aftershocks that continued to torment these people. There have been over 60 aftershocks after the initial January 12th earthquake, and many were quite strong, ranging from 4.2 to 5.9 magnitude in strength. I experienced many such aftershocks during my term there, and each time I would hear people running through the streets in a complete state of panic, screaming with fear and trepidation. Many nervous people slept outside on the streets, far away from buildings and structures that could fall on top of them. There was no sense of calm or peace in Haiti. 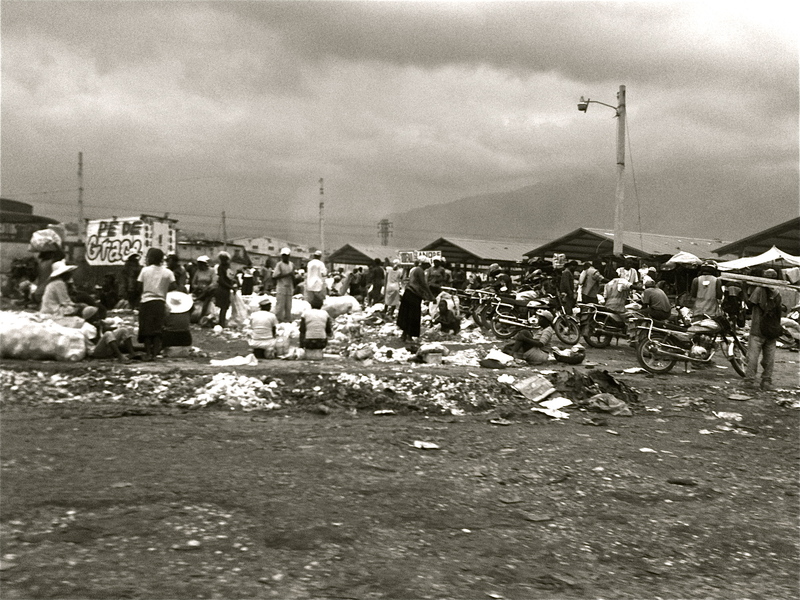 By the time that I arrived in Haiti, there were some marketplaces and stalls that had opened back up. 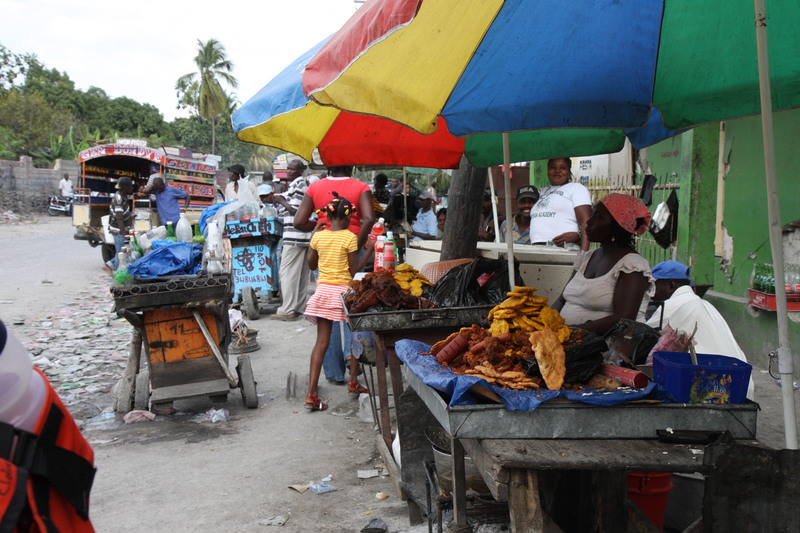 Various food and clothing stalls lined the damaged and cluttered streets as the people of Haiti tried to regain a sense of normalcy. With an unemployment rate of 85% before the earthquake, needless to say times were much more dire post-earthquake. It seemed like these marketplaces were bursting with life and vigor, but upon close inspection I saw that many people were selling junk- concrete blocks, bricks, broken pieces of iron, door knobs, and really anything that they could scavenge. These were desperate times, and I respected the strong determination and will of those who were trying to make something out of nothing. 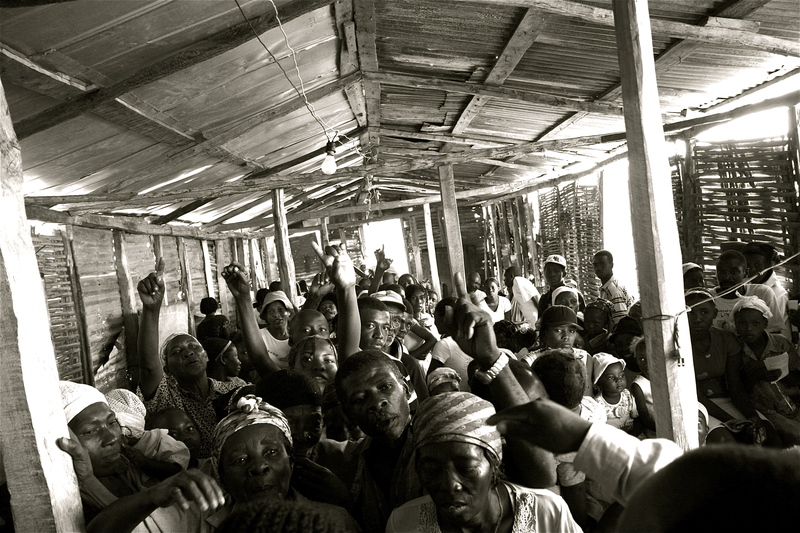 The presence of NGO’s (non-governmental organizations) was strong in Haiti, and it’s not an exaggeration to state that currently Haiti is functioning solely on foreign aid. Haiti was already in bad shape before the earthquake- as the poorest country in the Western Hemisphere, there were already a lot of NGO’s in Haiti pre-earthquake providing health care and environmental support. Over 230 organizations from all over the world responded to appeals for humanitarian aid after the earthquake, pledging funds and providing everything from medical care and food to shelter, latrines, engineers and other support personnel. Unfortunately in the beginning there was very little coordination among the organizations as the UN, which usually takes on an organizational and mediative role, was also affected. The UN building collapsed, taking along with it many of its employees, both expatriate and national staff, and even its mission chief. It was the gravest and greatest single loss in the history of the United Nations organization. 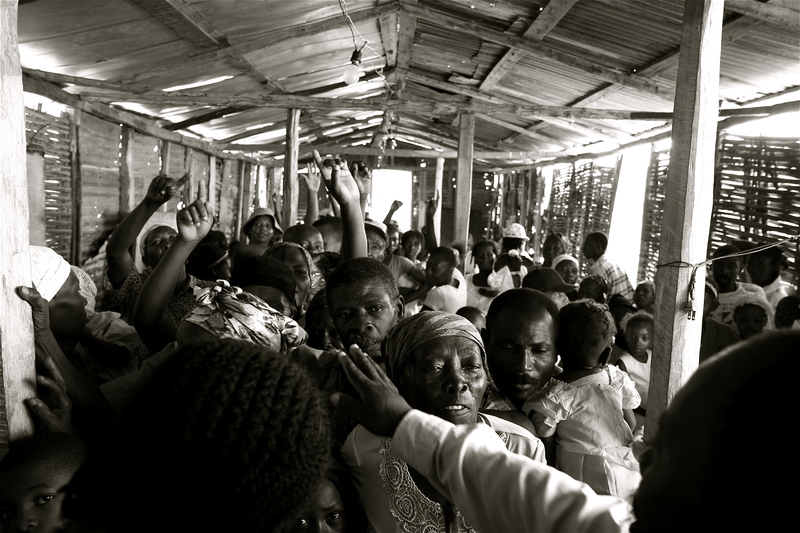 Confusion over who was in charge at the Port-au-Prince airport hampered early relief work. Flights weren’t being prioritized, and news reporters, TV crews and politicians were flying in first, while medical personnel and surgical supplies were diverted to the Dominican Republic, forced to find their own transportation across the border into Haiti. Who was to blame? Nobody was prepared for a disaster of this magnitude, and nobody could have predicted the exact needs at the time. It was one huge chaos that continued to deteriorate by the minute, rendering all who were involved into an unprecedented state of stress, panic and confusion. Although I have done humanitarian medical work in conflict/war settings, this was my first time working in a massive natural disaster scenario. Many of the aid workers that I met in Haiti who had a lot of experience working in natural disasters (like the 2004 Indonesian tsunami and the 2005 Kashmir earthquake) all unanimously stated that this was the worst that they have witnessed by far. How does the poorest country in the Western Hemisphere survive after experiencing one of the worst natural disasters in modern history? What happens when you strip everything away from a country that had nothing to begin with? It is estimated that it could take as much as $14 billion to rebuild this damaged nation. 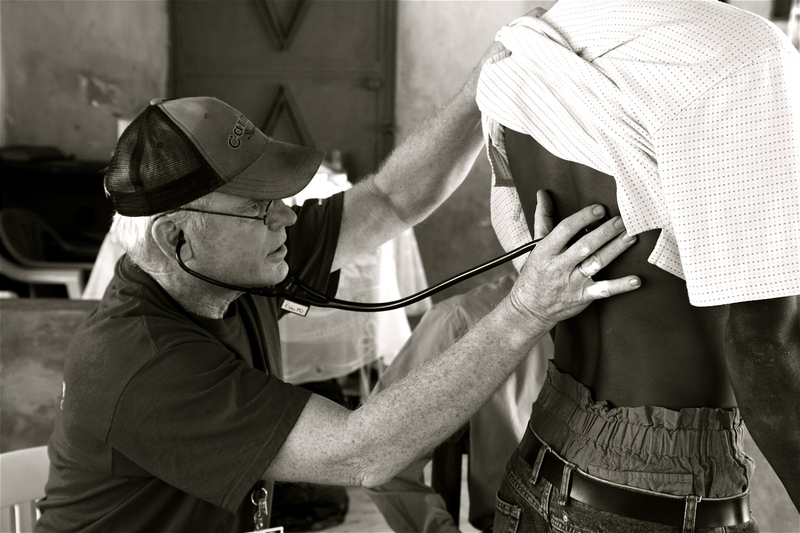 From what I witnessed during my month long medical mission there, that’s not all that is needed to rehabilitate Haiti. Haiti may never be free from foreign aid- it never really ever was, but with hope, patience, donations and a lot of determination, we can all contribute in reviving this soulful country back to health. 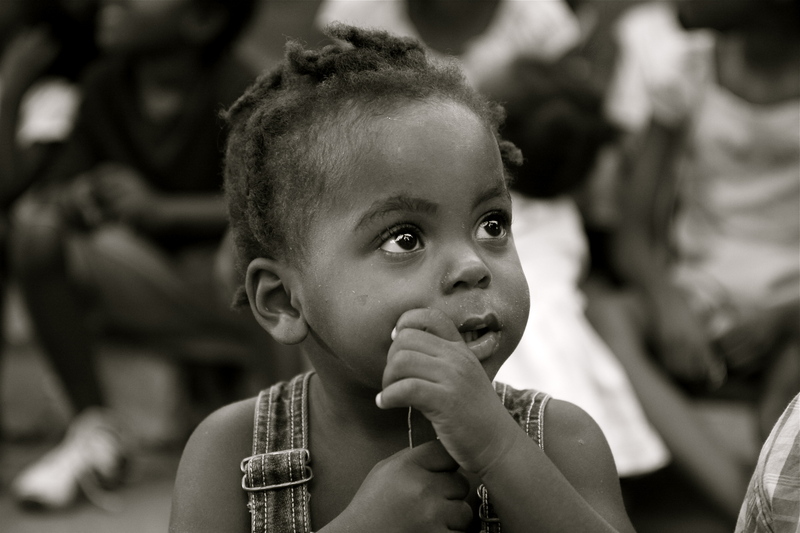 The beautiful children, the future of Haiti, certainly deserve a chance. The most effective way that people can assist the ongoing relief efforts in Haiti is by making cash contributions to humanitarian organizations that are conducting relief operations. 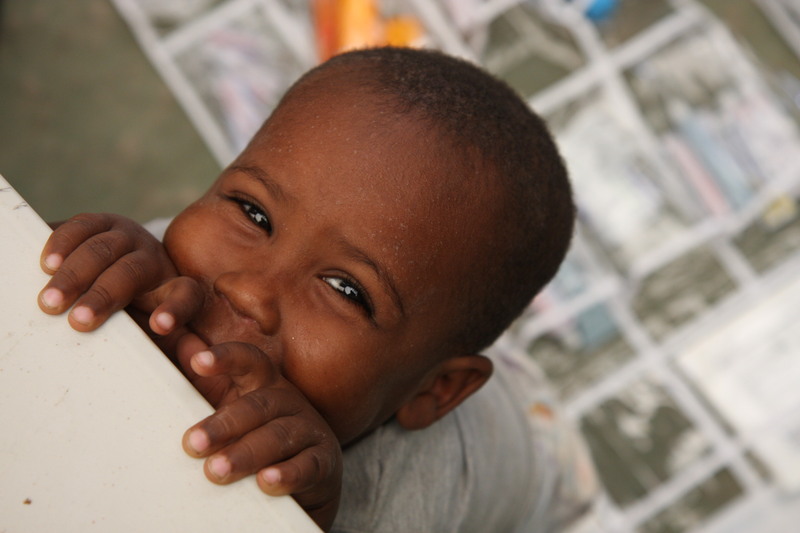 Information on organizations responding to the humanitarian situation in Haiti is available at www.reliefweb.int.